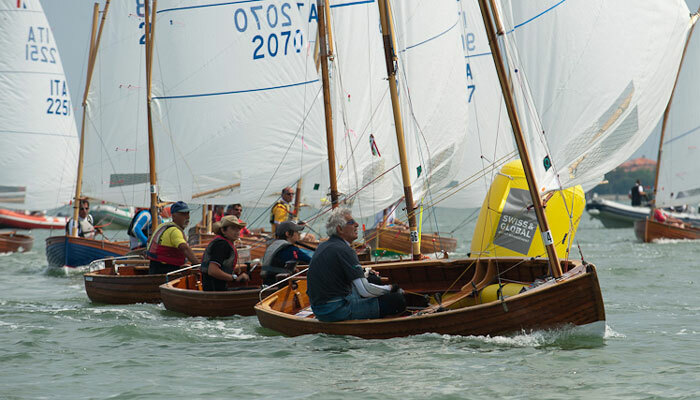 The term 'vintage' is rarely used in respect of racing dinghies, however in 1920 the Olympic Federation felt that a suitable dinghy should be used in addition to the 40m.2, 30m.2, 15m., 12m., 10m., 8m., 7m., and 6m. 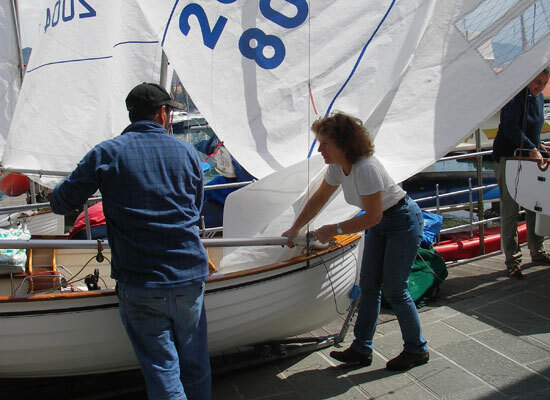 keelboat classes. The International 12 foot dinghy was selected. 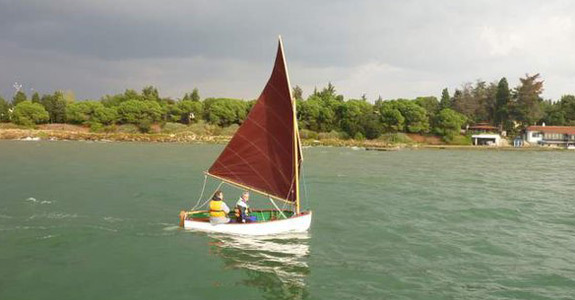 This class is still active in Ireland, in two forms, the original single sail rig, and the later Dublin Bay Sailing Club innovation of moving the mast aft and providing a jib, but with no increase in total sail area. 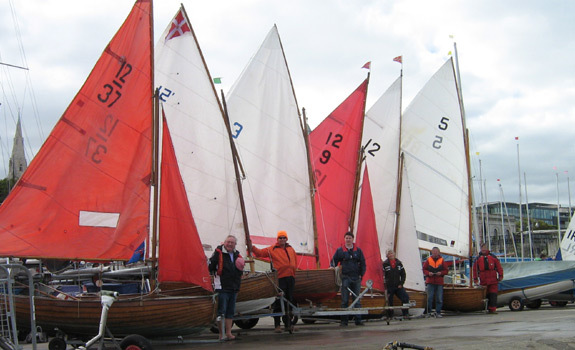 The Royal St. George Yacht Club organised the fifth Irish Championship of recent years, on 2nd September 2018. Entries came from far and wide including one UK entry, one dinghy from Clew Bay and one from Lough Ree. Four races were held in Dun Laoghaire Harbour, two in the morning and two in the afternoon. Race one was held in 6 knots and George Miller in 'Pixie' led from beginning to the end of two laps of the triangular course, with 'Scythian' second, and 'Cora' third. For race two the wind had increased to 10 knots, and Gavan Johnson in 'Albany' led initially, to be passed by Mark Delany in 'Cora' who took the gun. In this race 'Scythian' had a difficulty with her rig, and in solving that problem, she created another by capsizing! 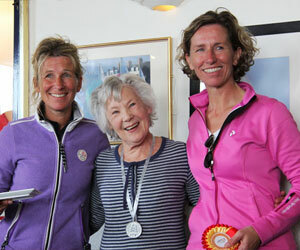 A leisurely lunch was held in the clubhouse, at which point last year’s winner 'Cora' held a small lead in the overall standings. 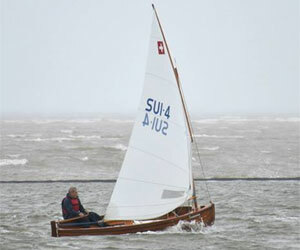 George Miller in 'Pixie' won race three from 'Scythian' in an unstable light wind, and in the final race Andrew Johnston's 'Scythian' took an early lead and won from 'Pixie'. Si è appena concluso con successo il Dinghy Day a Roma nella bellissima location del Circolo degli Esteri e, come è ormai consuetudine, inauguriamo la stagione del Dinghy 12' Classico con la prima regata del XVII Trofeo del Dinghy 12' Classico in programma il 7-8 Aprile 2018 nel Golfo dei Poeti e più precisamente a LE GRAZIE. Una nuova e suggestiva location per i Dinghy Classici tra barche d'epoca e classiche che normalmente sono di stanza in questo bellissimo seno del Golfo spezzino. Curerà l'organizzazione dell'evento l'ottimo Circolo Velico La Spezia. Seconda prova nel mese di Maggio e più precisamente il 5-6 Maggio 2018. 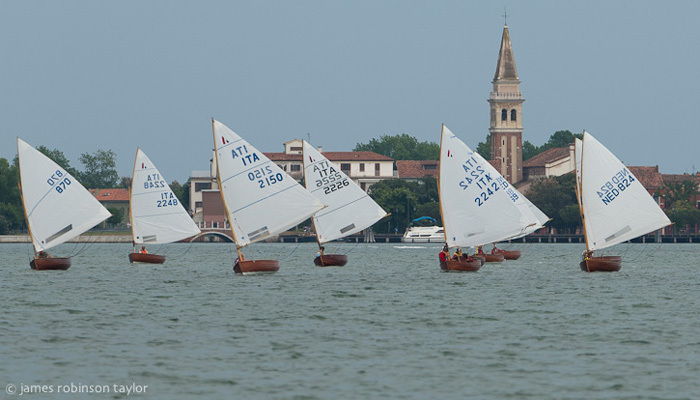 Si torna dopo lunga assenza a VENEZIA per una regata dedicata ai Dinghy 12' Classici nella suggestiva cornice della città lagunare al LIDO di VENEZIA con la consueta organizzazione dell'Associazione Velica Lido capitanata da Franco Scalabrin. 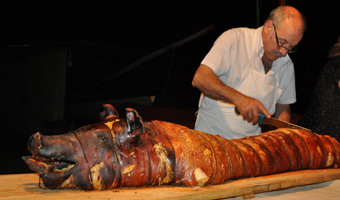 Per la terza prova in programma il 9-10 Giugno 2018, si è pensato di confermare una location che da qualche anno è molto gradita da tutti i dinghisti: RIMINI. Saremo ancora una volta ospiti del Club Nautico Rimini. La quarta prova sarà disputata il 7-8 Luglio 2018 in una località che è una new entry assoluta per i Dinghy 12' Classici, ORTA, dove saremo ospiti dell'accogliente Circolo Velico Orta e del suo instancabile Presidente Gianmaria Brambilla. Chiuderà la stagione il 22-23 settembre 2018, la settimana dopo il Campionato Italiano che si disputerà nella vicina Punta Ala, una località ormai ben nota a tutti i dinghisti classici per la straordinaria accoglienza che da qualche anno a questa parte ci riserva: SAN VINCENZO che gode dell'ormai collaudatissima cooperazione del Club Nautico San Vincenzo, dello Yacht Club San Vincenzo e del Marina di San Vincenzo nonché delle due anime dell'evento, Marcello Corsi ed Uberto Capannoli. Come vedete si tratta di un calendario piuttosto articolato con tre locations marine, una lacustre ed una lagunare che di certo renderà interessante la competizione in acqua e, perché no, renderà piacevole anche la visita di posti con notevoli attrattive paesaggistiche e/o culturali. The International 12 foot and DBSC 12 foot dinghy Irish championships were scheduled for Dun Laoghaire for the weekend of 10th September 2017. However, the weather forecast was very poor, so, the Royal St. George Yacht Club decided to postpone the event for one week. 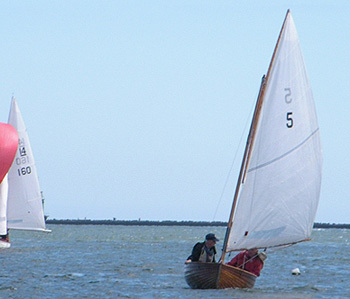 The two classes of boats have identical hulls, but the International 12 has all the sail area in the mainsail, while the DBSC version has a small jib. The International 12s were approved equipment for the 1920 and 1928 Olympic Games. The weather on 17th September was ideal, with bright sunshine and a force two breeze from the north. In race one, the International 12s pulled away from the DBSC 12s, with Mark Delany's Cora a half boatlength ahead of George Millar's Pixie, as they approached the windward mark. However, Cora was unable to lay the mark, and was forced to gybe away. This handed the lead to Pixie, and dropped Cora to third place behind Gavan Johnson and Gail Varian's Albany. It took Cora the whole of the next lap to regain her second place. In race two Cora got the best start, and at the windward mark she led from Paul and Tom Gillespie's Calypso. And the order remained thus until the final beat to the finishing line, when Pixie and Albany managed to overtake Calypso. The fleet came ashore for a sociable lunch. After lunch, a new course was laid with longer reaching legs, and in the third race, Cora and Albany led around the first windward mark, but the superior offwind speed of the International 12s brought Pixie up into second place, and they retained this order to the finish. In the final race, Pixie needed to win to retain her championship title. Calypso was now being sailed single handed, and she got the best of the start, and held second place behind Cora at the windward mark. Pixie's superior offwind speed came to the fore again, and she slipped into second place, which she retained to the finish. Thus, Cora becomes the International 12 ft. dinghy champion and Albany retains her title as Dublin Bay Sailing Club 12 Ft. dinghy champion. A gaggle of boats approach the leeward mark during race2. With so much interest in single handed Olympic sailing, it is appropriate that the 12 Footers had their Irish championships a week after Annalise's* success in Rio. The 12 Footers were used for the Olympic Games in 1920 and 1928. These two classes share the same hull design, but they carry different rigs, the International 12 Footer has a single sail standing lug rig, while the DBSC 12 has the mast located further aft, and uses the same sail area in a gunter rig, along with a small jib. Racing within Dun Laoghaire harbour commenced with a force two wind from the north-west, on a traditional triangular course. In race one, two DBSC 12s, Albany and Sgadan quickly pulled away from the fleet, and swopped places several times during the two lap race, before veteran sailor David Sarratt, and his friend Gail Varian, in Sgadan, took the gun. By race two the wind dropped to a fickle force one, causing the race officer Vincent Delany to reduce the race to one lap. On the upwind beat the DBSC boats performed best, with Sgadan and Albany well ahead of the rest. However, the larger mainsail of the international boats enabled the international boats to travel faster. Cora lead from Pixie at the leeward mark where the entire fleet became bunched, and whistling for more wind. At the finish it was George and his son Andrew Miller in Pixie who took the gun. When the fleet went ashore for lunch, Sgadan, Albany and Pixie were all sharing the lead on 9 points. When they returned to the racing area the wind was again very fickle, this time, from the north east, so the race was again shortened after one lap. Cora was recalled at the start which set her at a disadvantage. In the force one wind, Albany the DBSC 12, sailed by brothers-in-law Tim Varian and Gavan Johnson, won race three. 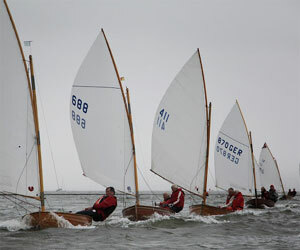 The final race was sailed in a force two breeze which kept all the competitors bunched for the entire race of two laps. Again, it was Sgadan which pulled out ahead with Pixie second. These two were on equal points, and thus the Irish 12 foot championship went to the DBSC 12, and winner of the final race. * Annalise Murphy, winner of a silver medal sailing a Laser Radial at the 2016 Summer Olympics. The championships took place in Dun Laoghaire on 30th. August under the burgee of the Royal St. George Yacht Club. 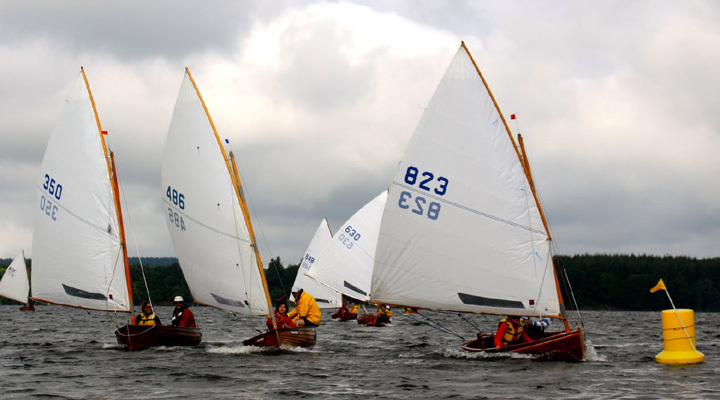 It is a number of years since a Class Championship was held in Ireland, but since the class centenary in West Kirby in 2013 there is a serious revival of the class, not only in Ireland but also on inshore and lake venues on continental Europe. Why do two classes have a combined championship? The answer is that the International 12 Foot Dinghy was the one-design boat used in the 1920 and 1928 Olympics. Following these events there was a growth of interest in the class in Britain and in Ireland, and many boats were built in the 1930s. 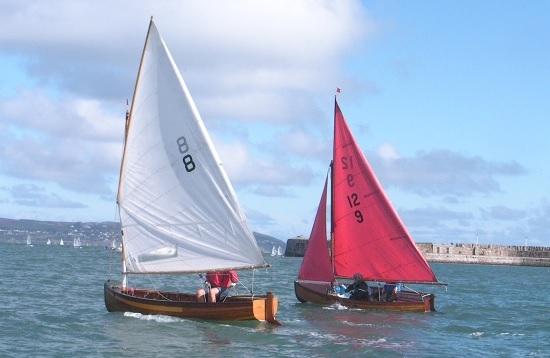 In Dublin Bay in the 1960s there was a suggestion that the International 12 Foot Dinghies as an open boat were taking too much water over the bow, so the Dublin boats were modified by moving the mast further aft, adding a small jib, and a foredeck. Today, the Int. 12s and DBSC 12s race against each other on an equal footing. The boats can be sailed singled handed or with a second person as a crew. Race one was held inside Dun Laoghaire Harbour in a 4 knot northerly wind, which was unstable and soon started to veer towards the east. George Millers Pixie sailed a perfect race to take the gun from Scythian sailed by Andrew Johnston, and Albany sailed by Tim and Gail Varian. The wind had settled in the east for race two. Again, Pixie led the fleet from the start and progressively increased her lead from the bunch behind. At the finish it was Pixie followed by Mark and Matthew Delany in Cora who managed to hold Scythian astern. After the two races, crews took their boats ashore for a liquid lunch. In the afternoon, racing was in Seapoint Bay, the traditional home for the 12 Foot Dinghies in the 1930s. The wind had increased to about 8 knots from the south east with a flat sea. By this stage the fleet were growing in confidence and beginning to put pressure on the dominant Pixie. At the finish it was Pixie, Cora and Scythian who were able to maximize benefit from the ebbing tide. The final race was run on a larger course with more rounds of the course. Would Pixie be able to win again? Initially Scythian sailed very well, and on the offwind leg she had better speed than Pixie. Then on the second beat the two boats entered a tacking match. At one stage Scythian crossed ahead of Pixie and by the time they reached the windward mark these two had pulled well clear of the rest of the fleet. 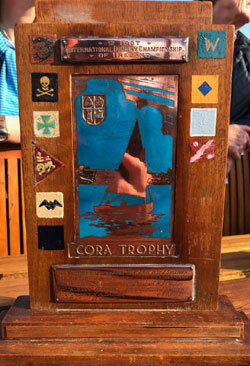 However Pixie recovered the lead by clever tactics, and she worked hard on the offwind leg and took her fourth win to lift the historic CORA TROPHY. Analysis: Although the DBSC boats are potentially faster upwind, they appear to have less power than the International 12s on the off-wind legs. At the end of the day the three podium places were taken by the international 12s. The top two boats were sailed single handed which gave them a power to weight ratio advantage in the light winds over the crewed boats. I've read your blog Site 12footnews. I would like to thank you for your interest about the Italian Dinghy 12' Class and for the Wooden Classic section that I'm honoured to lead after Giuseppe La Scala. I'm very interested in what our Dutch friends really think of us. We share the passion for classic boats and this is the reason why we must not forget the marine ethical code which belongs to our style of life. Without any doubt, I believe that most of Italian dinghy sailors would like to share friendship and wellness with foreign competitors so, first of all, you should respect the Italian dinghy 12' way. Our history is not worse than the Dutch one, it is just different. The Italian wooden boats are essentially the same from the beginning. 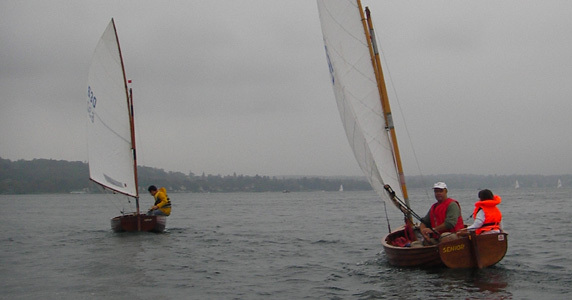 Our rule has slightly changed during the years and we've introduced the fiberglass construction in order to save the class when lots of sailors abandoned dinghy 12' to sail other fiberglass boats. 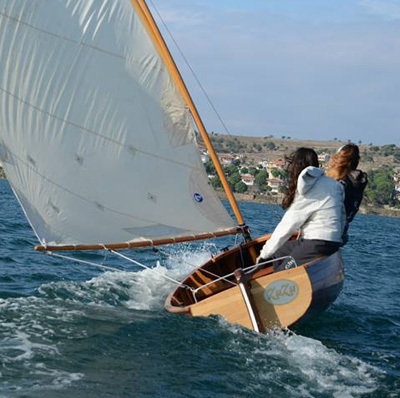 For example, Lodoletta, a truly wooden veteran dinghy 12', built in 1929 and recently restored is perfectly in compliance with the rule of her age and still screamingly fast. In the 50s and 60s the Italian dinghies were sophisticated and their construction was an example of art in wooden boatbuilding. The history of the Italian Dinghy 12' Class is quite similar to the history of the International Dragon Class. The Dragon was designed by Johan Anker in 1929 and the Class introduced fiberglass hulls in order to survive when all the world was asking for it, and now it is strongly increasing year by year. You surely know that the finest sailors of the world are racing Dragons and the International Dragon Class is now one of the best and more competitive classes of the world. The Dragon sailors race wooden and fiberglass boats together, all of them with aluminium rig and at the last European Championship in San Remo (Italy), the wooden boat “Debuttant” built by Pedersen & Thuesen in 1959 won overall. Same story for the Wianno senior Class (John Fitzgerald Kennedy's beloved boat) best diffused in the USA. Dinghy is of course quite different from a Dragon, but our wooden dinghies are almost as fast as the fiberglass boats and in some races they do win. 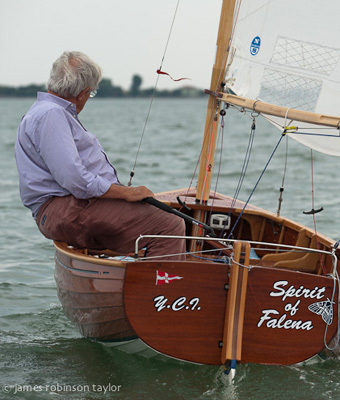 A wooden boat tillered by Paolo Viacava won an Italian Championship some years ago. My personal opinion is that a wooden dinghy with an aluminium rig is as fast as a fiberglass one with the same rig. But this is just an opinion never supported by experience. Anyway, as you can easily understand we are very proud of the development of our boats and consequently (though the Dragon Class uses aluminium rigs) we want to continue to race with wooden rig because we love classic wooden boats. 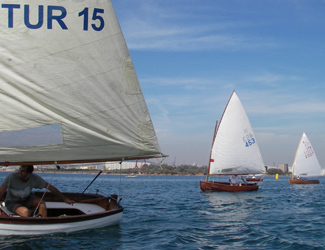 I race dinghy 12' but I have a good experience of vintage and classic boats races in the Med. I raced Al Na'ir III which is a S&S boat built 1964, 47 feet loa and won the Prada Challenge for Classic Yachts in 2002, second in 2003 and I won The C.I.M. Challenge for Classic Yachts in 2004. I still own Al Na'ir and in 2014 we won the Barcolana Classic in Trieste. I also raced Sirius, a N.Y. 32, 45 feet loa, built in New York by Nevins and designed by Olin Stephens in 1936, second in 2007 Panerai Classic Yacht Challenge and winner of Trofeo Città di Trieste in 2012. Last but not least I own a wooden Dragon that I'm restoring. I'm telling you all this because I would like you to know that you are not the only one who loves classic boats. I would like you to understand that I strongly want to preserve the classic spirit of our boats Dinghy 12' but, at the same time, I want the boats to be both amusing and performing. This way surely attracts young enthusiasts and let the Class grow up. We have a stunning racing circuit reserved to wooden dinghies with five races and many other races with a special classification for wooden boats. 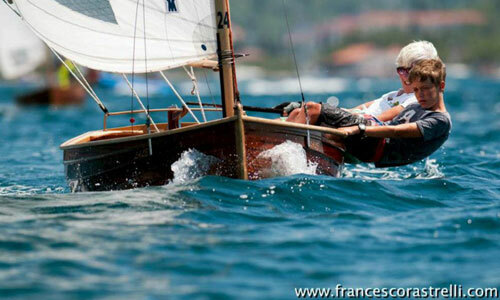 For example in the most competitive Italian National Trophy there is a special classement for wooden dinghies. Same thing in the Italian Championship. We really do like enjoying racing! You wrote that we have only 70 wooden dinghy sailors. The participation to a Race reserved to woodies has an average of 42 boats though there are much more than 70 wooden dinghy owners in Italy Giuseppe La Scala worked very hard to increase the wooden dinghy fleet and I'll do my best to continue in his work. I remember that, when we came to Holland for your 100th birthday's meeting, you and some other Dutch friends asked to come in Bracciano to race with us. We were very pleased and Giorgio Pizzarello invited you. You also asked for Italian wooden boats for you and Wim to be able to participate at the Bracciano event and you'll get them. Nevertheless... I've read that you do not intend to program friendship series in Italy, but only in Germany, France and Holland. The Italians are not your friends anymore? You also wrote that some discussions about standardisation of dinghy took place between Holland and Italy but that did not reach any significant result. It is true because you don't want in any way to optimize your boats for racing conditions different from yours. In fact in Bracciano and in Venice Dutch boats were near to win because of water and weather conditions. 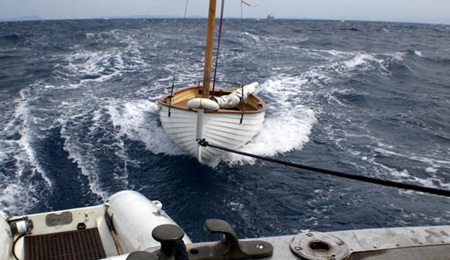 I wrote of classic boats that modernized their equipment in order to satisfy their sailors. This is the reason why we don't use cotton sails or ancient ropes anymore. Is it a crime? I'm quite sure that if you optimize your boats you can easily compete with ours. Think about Giorgio Pizzarello who owns a Dutch dinghy and races her in Italy. 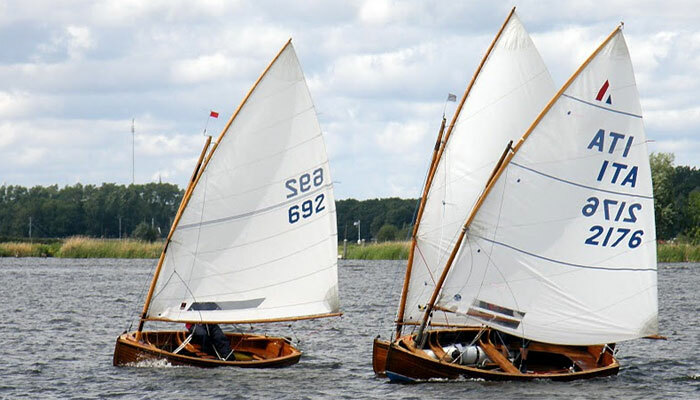 When we came to Loosdrecht we were not so fast as you because of our sail plan, not because of our boats! When you write that nobody wants to put water into wine you should think that those who really want to enjoy racing a dinghy, must work on the boat and trim to manage to get just wine. I think this is the spirit of the whole world of classic and vintage boats used for racing. Last but not least, I believe that the international development of the Dinghy Class passes through the national Organizations, so what I wrote to you is just my personal opinion. Nevertheless I'll be very pleased if you could publish it on your Blog Site. I'll do the same. See you in Bracciano or maybe before in a friendship series if the Italians are invited. 2015 is the year in which we are starting the second century of the 12' dinghy in the Netherlands. 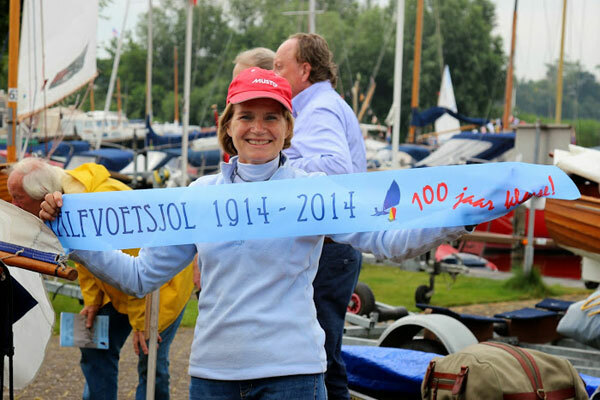 In 2014 we celebrated the 100 year anniversary held at the "Loosdrechtse Plassen". 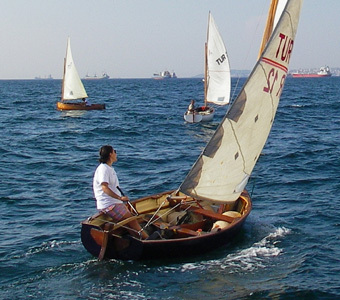 Over 174 12' dinghy sailors where present from all over the world in their classic traditional wooden boats. New and old. 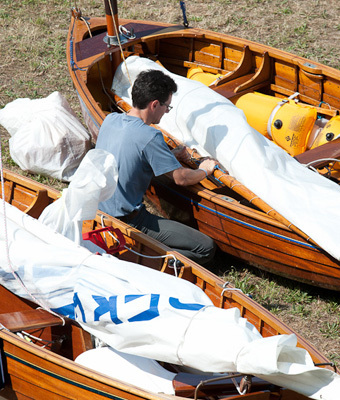 Five new dinghies were traditionally baptized and were presented to the dinghy world. 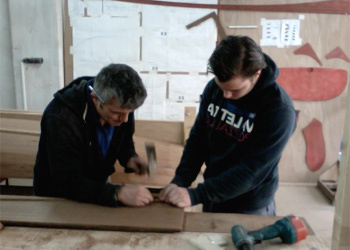 It is the oldest one design class in the Netherlands and, against the odds, the fastest growing wooden class. It was a once in a lifetime event. 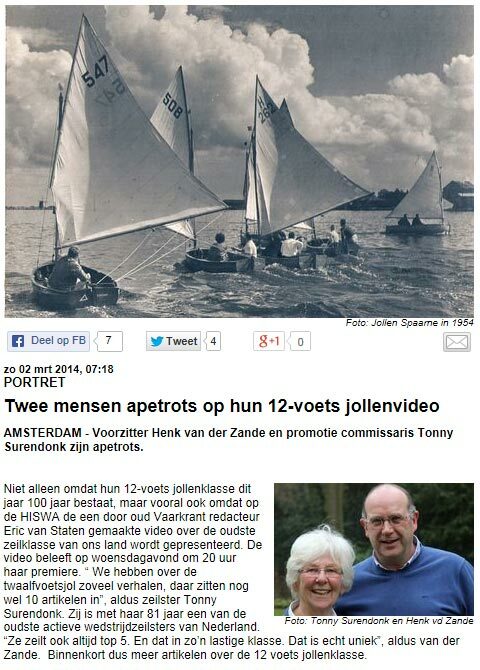 No better evidence of the strength of the Dutch way of sailing a 12' dinghy. In January 2015 I became the successor of Henk van der Zande as chairman of the Dutch Twaalfvoetsjollenclub. It is thanks to Henk and his committee, and those who went before them, that the Twaalfvoetsjollenclub is in such good shape today. They in turn became successful because of their members. 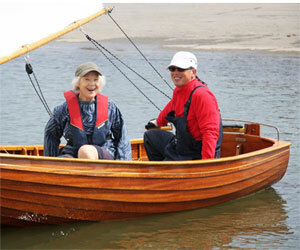 Great sailors, with so much affection for sailing a traditional wooden boat. 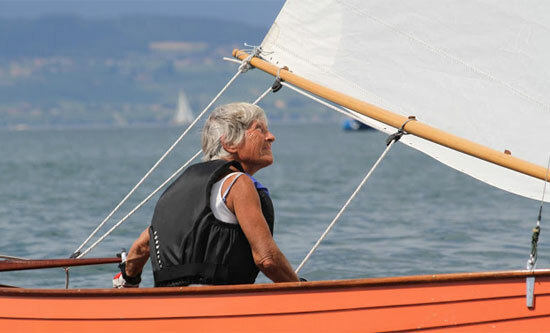 People who are members of a sailing family and who share a vision about their passion: sailing in wooden boats, sailing in fair competition, getting the best out of their sailing skills and strategic insight. But most of all people who find it important that traditional and sustainable values are preserved. 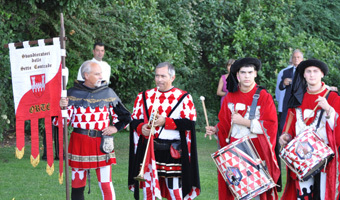 It was in the annual meeting of 2013 that the members voted to preserve this tradition. It was a democratic decision and at this moment there are no signals that that vison has changed. I'm part of that vision because of the way I voted in 2013 and because I think that the board of our Twaalvoetsjollenclub has to abide by the decisions made in 2013. The Royal Dutch Watersport Association is anticipating a dramatic reduction of competitive and recreational sailors. In their 2010 report they predicted a 40% reduction in competitors in sailing events. Against that expectation the 12' dinghy is still growing. In the 1960s the 12' dinghy in the Netherlands was in great problems and people suspected that the end was near. At this moment we are healthy and growing. I have not found any reason for this development other than the image of the 12' dinghy and the consistent vision of keeping the 12' dinghy traditional. It is very well suited for the Dutch weather and water conditions. 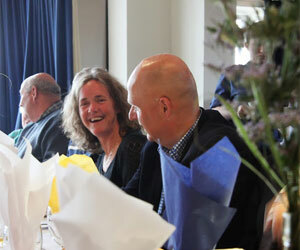 And the sailors are also fond of the social aspects of sailing this lovely boat. I did not yet have had discussions about this Dutch vision of 12' dinghy sailing with sailors from other countries. I do know however that those sailors also have very valid reasons on which their vision of sailing came alive. At this moment it is my personal opinion that structural upgrading or downgrading of the dinghies in the different countries is not realistic. In his letter from Fabio Mangione says that the Dutch dinghy sailors should respect the Italian way of dinghy sailing. He also asked if the Italian dinghy sailors and the Dutch are still friends. In my opinion these points are of great importance. What I have heard from Dutch dinghy sailors is that they have good memories and warm feelings for sailing in Italy with Italian dinghy sailors. One of the problems, however, is the focus on the different views of the development of the 12' dinghy. Where the Dutch seek for tradition and excelling in strategic sailing and boat handling to win a competition the Italians like the technical component to the essential instruments in their dinghy. The technical component has the purpose to make the dinghy faster. I feel upmost respect for that vision with the remark that in the Netherlands we also have a vision. History in the Netherlands has shown modernisation is not often successful. Indeed, it has destroyed some classes. In response to the two questions mentioned by Fabio Mangione I would say, yes; there is friendship between sailors in Italy and the Netherlands, and yes there is respect for the Italian vision of developing their dinghies. Those two components are the basics for a good future in our sport. For Fabio I wish him a successful time as president of the classic wood section of the AICD. I look forward to compete with you all on the water and speak joyfully about everything and especially how we enjoy sailing our 12' dinghies. 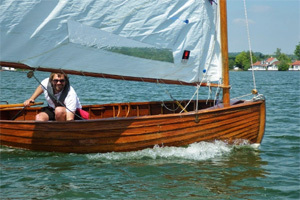 Dear foreign friends, the Dinghy 12' is an old but contemporary boat that we all love and use to race or simply sail. My name is Fabio Mangione, the new Italian Dinghy Class Association Delegate for the Classic 12' wooden Dinghies Division. I succeeded Giuseppe La Scala in this role. I thank You a lot Giuseppe for your passion and hard work. You allowed a great development of our beloved Dinghy 12' Class. 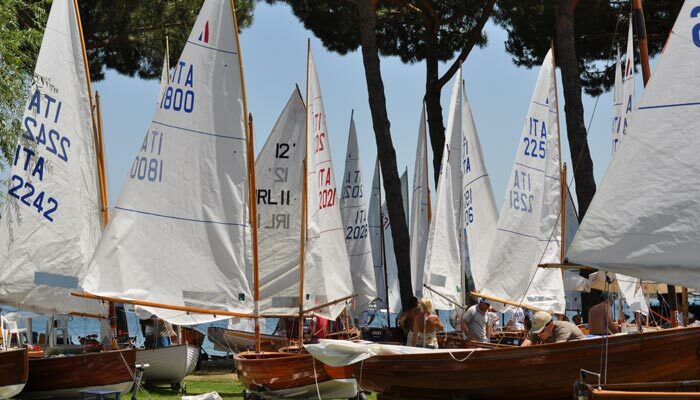 I'll do my best to let the Italian and Foreign sailors have good time sailing their Classic dinghies in Italy. You'll find in some days the complete calendar scheduled on the AICD web site. As You can see there are two locations which are well known to foreign competitors: Naples and Bracciano. 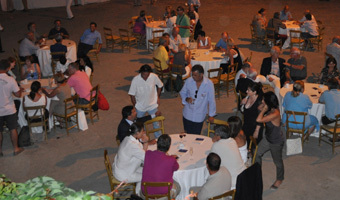 We decided to organize both Naples and Bracciano on 3 days in order to facilitate competitors from abroad. It could be a pleasant racing holiday for You too! 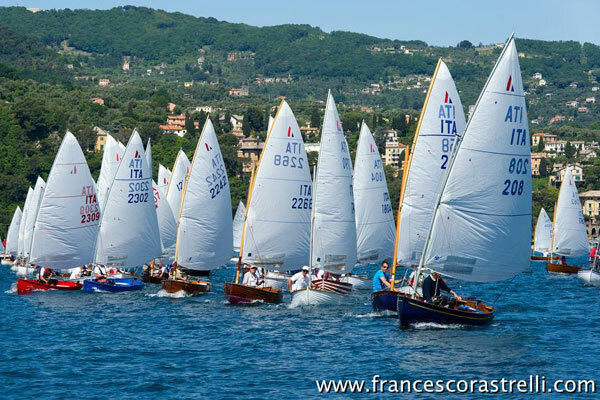 On 22nd-23rd-24th May , in Portofino will take place the traditional Race Bombola d'Oro which is just some days before La Spezia (May 30th-31st) and on 12th-13th September will take place the Monaco Classic Week valid for Cockshott Trophy, just some days after Varazze (September 5th-6th) which is not too far away from Montecarlo. Last but not least, Rimini has many actractions: a very good Club House, well known international hospitality and stunning restaurants! We've conceived a season of friendship, no matter what kind of Dinghy we sail. I believe that we all feel like racing and sailing our dinghies 12' together and we will. In the last few days we've started a brand new internet site of the AICD Classic Wooden Dinghy 12' Division: www.dinghy12classico.it I hope that You will visit it and like it. You can subscribe via the entry form and create Your own profile with Your pictures, boats, palmares and thoughts. 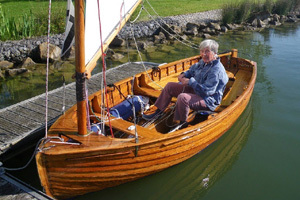 There is also a blog where You can write Your opinions and a marketplace for wooden dinghies. 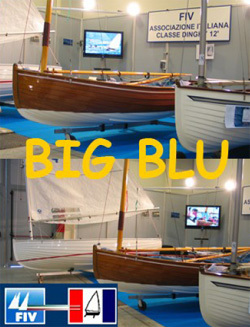 Enjoy the next sailing Dinghy 12' Classic season. Best Wishes for a Merry Christmas and a Happy New Year to all of You. Cunda, a small island situated in the north-west Aegean Sea could soon be a favoured destination for Dinghy sailors. The story begins with one of the Dinghies constructed by the Yachtworks shipyard of Bodrum, Turkey, a dozen or so years ago. The boat was purchased by a father-in-law as a present to his daughter's new husband, but due to lack of interest and insufficient maintenance it rapidly deteriorated. That would probably have been the end of the story had Sanem Sevinc not rescued it. 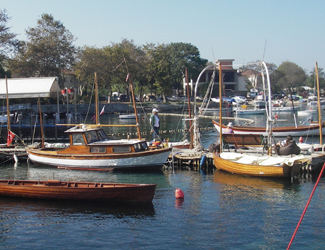 Cem Yalcin, a local boat builder, assured Sanem that he could return the boat to 'better than new' condition. 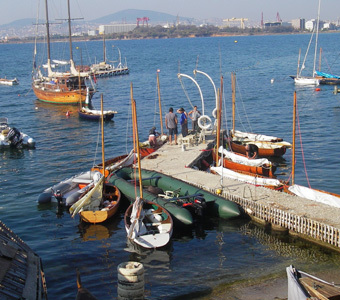 As the restoration progressed, Cem, a wooden boat lover, soon fell under the spell of the 12' Dinghy and resolved to establish a Dinghy sailing club on Cunda. With seven founder members the club will commence its activities in May 2015 and the first of nine Dinghies are already under construction. The Ortunc Club, a hotel situated in a secluded bay at the tip of the Lesbos Cunda Peninsula, which offers water sports activities to its guests, is now planning to add Dinghies to its fleet. This charming, typical Aegaen island, hopes to be ready to welcome dinghy sailors from across Europe to participate in races in 2015. With thanks to Zeynep Fencimen who supplied all the information and most of the words for this article. at the Portes ouvertes des ateliers d'artistes in Boulogne-Billancourt, France. Embarquez avec moi pour une petite balade en Dinghy 12' à travers les vagues de Vincent Van Gogh, Gustave Caillebotte, Albert Clouard et bien d'autres ! 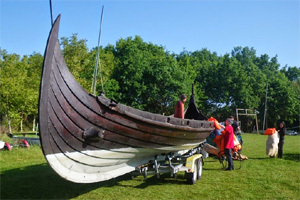 In celebration of the 1000 years since Brian Boru the High King of Ireland fought against an alliance of Irish and Viking troops, Clontarf Yacht and Boat Club decided to organise a two day classic boat event to mark such an important anniversary. Two Water Wags were delighted to be joined by a classic International 12 footer racing among the E boats, Lasers, Optimist, plastic IDRA 14s and a number of bilge keeled cruisers none of which would be classed as Classic. The real Classic was Dorade an International 12 footer. Racing was held on a triangular course of an indeterminate number of rounds. A crowd of interested spectators watched the event from the shore. After the racing was over, we were escorted to a mooring from which the club launch took us ashore, and advised us that barmbrack* was available if we moved quickly. Fortunately there was some alcoholic beverage, strawberries and ice cream as well as the barmbrack. After lunch Ceolthas Cluain Tarbh provided us with some traditional music and dancing. By 16.00hrs it was time to return home. After admiring Dorade and complimenting its owner, Aidan Henry, on his fine boat in the dinghy park, we headed back out to the moorings. 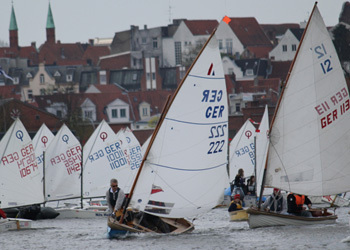 171 Dinghies on the start line at Loosdrechtse Plassen! 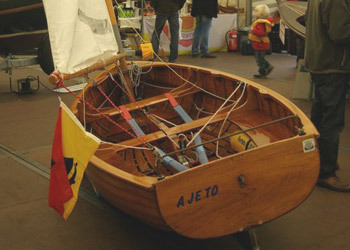 The event commemorated the 100th anniversary of the adoption of the BRA 'A' Class Dinghy as a national class in the Netherlands and Belgium in April 1914. 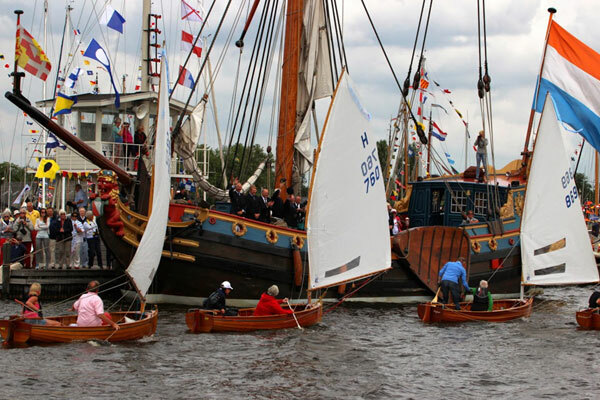 Boats and crews from a dozen countries joined their Dutch cousins to celebrate with a party worthy of the Guinness Book of Records. 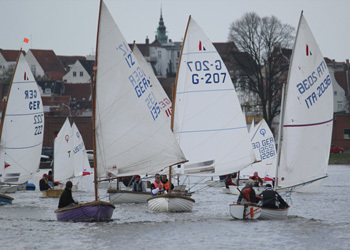 The regatta included a Dinghy Parade and a mixture of serious and 'fun' races. Class newcomer, Fred Knitel, finished first and Italian sailor Umberto Campannoli was the highest-placed foreigner in 5th place. Everybody's favourite, Tony Surendonk, was the first female finisher in 10th place. Photo: Yvonne Ransijn - The parade past the flagship. Photo: Yvonne Ransijn - The competition was fierce! The champions of yesteryear competed in the 'Champion of Champions' event. Winner, by a short head, was Wim Bleeker followed by his brother Pieter. Je reviens tout juste du lac d'Ailette. Le temps a été magnifique, l’Hôtel du Golf très accueillant, les organisateurs très sympathiques, et mes 8 adversaires redoutables. I'm back from the Ailette Lake. The weather was fantastic, the Hotel du Golf very welcoming, the regatta organisers very friendly and my 8 opponents competitive. Forcément en régate en dériveur, les photos passent après la course alors elles ne montrent pas l'acharnement de la bataille de samedi. Néanmoins place aux images. Tout d'abord, des gens venus du Nord ont essayé de participer à notre régate. OK, leur bateau était bien un monocoque classique en bois à clins, mais nous avons jugé qu'il s'écartait trop de la jauge tant hollandaise qu'italienne pour concourir. Ils sont repartis pour piller Compiègne. First, some people from the North tried to participate in our event. True, their boat was a classic, wooden, mono-hull, clinker built, but we ruled that it was too far from the Dutch or even the Italian class rules to participate. So they left for Compiègne to loot and pillage. La base nautique d'Ailette est vraiment impressionnante... tout est grand, propre et fonctionnel. Nous préparons les Dinghy 12 samedi matin. Marie-Claire peaufine les derniers détails. Elle aura le prix 'Fémina de la Régate'. Marie-Claire is tuning her boat. She won the coveted female crew prize. Mon technicien me fait signe que mon bolide est prêt et qu'il est temps de partir. My mechanic signals me that my rocket is ready and that we're good to go. Moins de chance encore pour Victor, qui a du réparer une voie d'eau et qui de ce fait a manqué les 2 premières manches sur 6. Even less luck for Victor who suffered a big leak and had to miss the 2 first races. Fred UDO, lui a eu beaucoup plus de succès, il gagnera cette édition 2014. Fred UDO was much more successful as he won the 2014 Ailette regatta. Pierrot dans son Dinghy orange. Il est allé taquiner les champions et a failli gagner une manche. Mais Fred est intervenu au moment crucial pour briser ses espoirs. 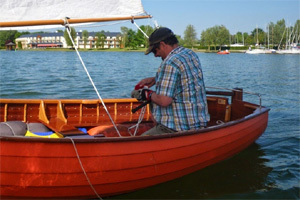 Pierrot in his orange Dinghy 12'. He tried to tickle the champions and almost won a race. But at the last moment, Fred intervened to take the first position and shatter his hopes. Mais Fred est intervenu au moment crucial pour briser ses espoirs. Le bateau du Comité de course. Qui insiste pour que les concurrents passent bien autour de TOUTES les bouées du parcours, même si ça le rend plus long. The boat of the Race Committee. 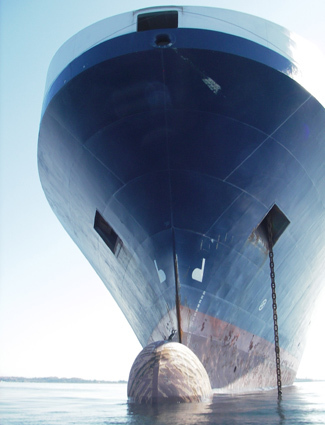 They insist that EVERY sailor rounds EVERY buoy, even if it makes the road longer. Le dimanche 18 mai 2014 ayant connu une pétole remarquable (France Météo précise que nous avons battu le record local, datant de 1887 ! ), il n'y a pas eu de manches après le samedi. On Sunday May 18th, 2014, the Ailette Lake got hit by a very strong dead calm (that even broke a local calm record dating back from 1887!!) so there were no more races after Saturday. Voici les résultats. Je ne suis pas trop mécontent de notre performance, 6ème sur 9, seul équipage en double par un vent irrégulier, soit, mais globalement plutôt faible. Here are the results, I'm not too unhappy about our score, 6th out of 9, we were the only double crew in an irregular but rather low winded regatta. Les trophées ont été remis, chaque participant a eu une casquette de l'association de voile d'Ailette, un numéro et un poster de Chasse Marée, un polo Atlantic Trophée. Fred UDO a eu en plus une énorme coupe et une très jolie régate dans une bouteille. 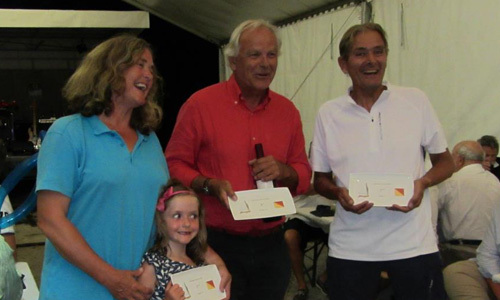 The prizes were distributed, each contestant got a cap from the Ailette Lake Sail association, one issue with poster of the Chasse Marée (a magazine covering classic boats in French) and a polo from Atlantic Trophée. Fred UDO also got a huge cup and a very pretty regatta in a bottle. Une jolie photo de tout le monde derrière la bannière du sponsor. Here is a nice picture of all of us behind the sponsor's banner. 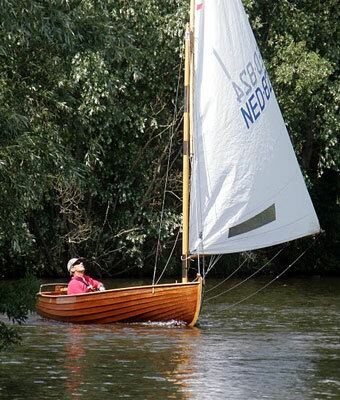 2014 marks the 100th anniversary of the introduction of the 12' Dinghy to the waterways of The Netherlands. 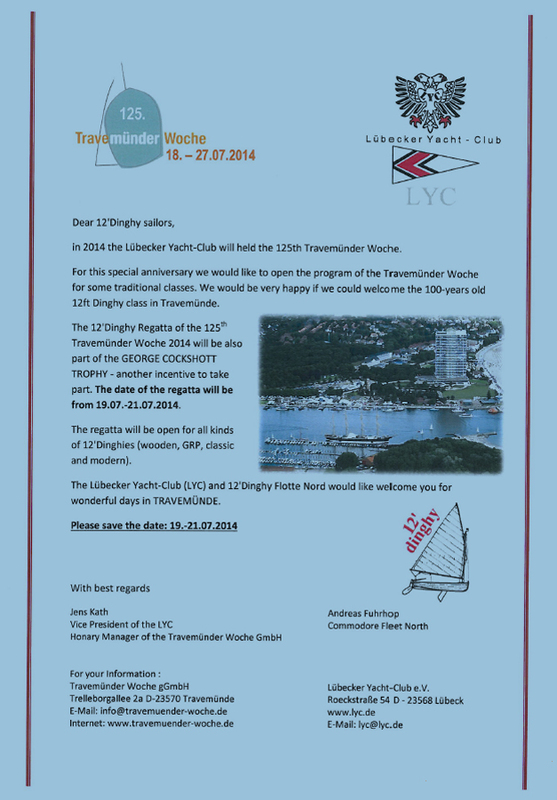 to be sailed at Loosdrechtse Plassen on 27-29 June 2014. George was there, keeping an eye on our stand. We were very happy to welcome Giuseppe la Scala and Renzo Santini who took the opportunity to meet officials and inspect the facilities of the Club Nautique Morgien which will host next year’s Swiss & Global Cup/Swiss Championships event on the weekend on July 11th–13th, 2014. My thanks to Denise, Zoë, Frédéric, Xavier, Michel, Bjorn, Nicolas, Pierrot & Pierre-Yves for their help in assembling and staffing the stand. Marie-Claire at the helm of BERK. Photo by Christian. Bonjour à tous. Ci-dessous un petit compte rendu de la classique de Sciez qui a eu lieu le 3 et 4 aout 2013. Enfin le 3 et le 4 pas tout à fait car la fête a commencé en fait le 1 aout par une petite croisière picnic, qui a emmené les participants de la base nautique de Sciez au port des pécheurs d'Anthy sur Léman. Le temps était beau et ensoleiller et accompagne d'une petite brise bien sympathique. Le picnic au bord de l'eau était très convivial comme d'habitude. Le vendredi 2, la 6m JI classique et la classe dinghy 12' commençait leur régate en début d'après-midi toujours sous un chaud soleil. Le vent tout d'abord assez faible a augmenté quelque peu pour permettre le bon déroulement des régates. Samedi matin 3 aout fin des régates pour les 6m JI et les dinghy 12'. Il est a noté que les deux parcours différents mais pas trop éloigne permettait aux uns et aux autres de s’apercevoir, voir même de se croiser. Samedi après-midi et dimanche : la classique de sciez réunissant plusieurs types de bateaux se déroulait avec un vent assez soutenu ce qui permettait une belle régate et de nombreux rebondissements dans le classement. Je remercie les dinghistes qui sont venus et ont participes a cet évènement. Jurri Rooyackers et Irene, Marie Claire Guegan, Pierre Moneger, qui sont venus de loin, mais aussi mes amis Suisses Frédéric, Steve, Xavier, sans oublier les français, Etienne, Sylvain, et tout particulièrement Nicolas Saumagne qui ne pouvant pas participer a eu la gentillesse de mettre son bateau à disposition. Je vous invite tous d'ors et déjà à prendre vos dispositions pour venir à la 15 ième édition de la classique de Sciez qui aura lieu en 2014. Here Jane Rowe gives Pieter Bleeker some sailing instruction whilst her husband Ernie takes the helm of Einepyk. Peter Cockshott recounts his memories of grandfather George, and Jane presents the prizes. 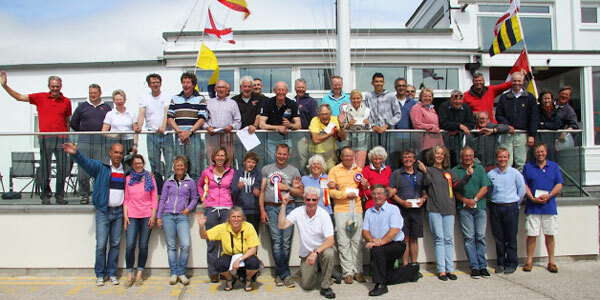 We received the warmest possible welcome from the members and officials of West Kirby Sailing Club. WKSC did us proud! Everything was superbly organised. 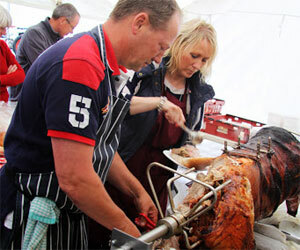 The hog roast and regatta dinner. Royal Oak - the only known survivor of the West Kirby 'Dreadnought' fleet. 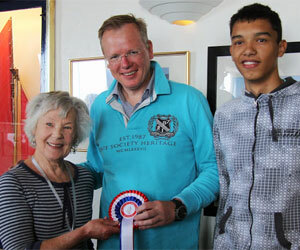 Roger & Ghislaine Harrison were the highest placed UK team. Team Canada: Nicky & Serena. Aidan & Billy from Ireland. Spanish sailor Victor de Juan in his newly completed amateur-built boat. Who could resist these ladies? Our Italian Centennial Championship was the 78th Edition and on this occasion it was decided to combine it with the 17th edition of the Trofeo SIAD Bombola d'Oro. The organization, being an Italian Championship, has been concentrated in Santa Margherita Ligure, so everybody was together. Logistically it was a huge amount of work, not least because all the boats were weighed and controlled prior to the first race. We have had 119 registered competitors, - all of them Italian excepting a young Turk, a Swiss and a German couple. We completed 5 races, all challenging and with a lot of wind. The overall victor, by just one point, was Giorgio "Dodo" Gorla ( sailing a GRP Lillia). 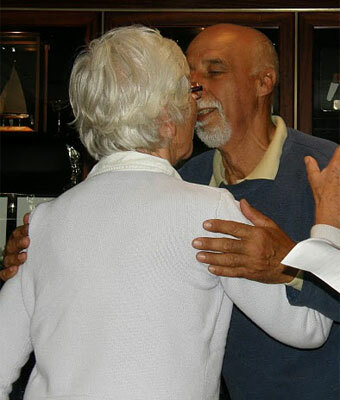 An extraordinary sailor of 68 years who has won two bronze olympic medals and two world championships sailing in the Star Class, Dodo fell in love with the 12' Dinghy in 2011, when we were all in Venice for the World Cup. He didn't compete in the World Cup event, but he was attracted and curious. 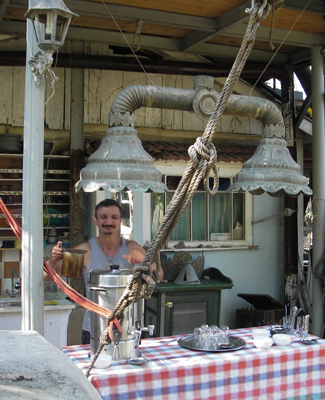 Originally from Piedmont (Novara) Dodo has spent his whole life in Venice where he was, before retiring, a chemist. 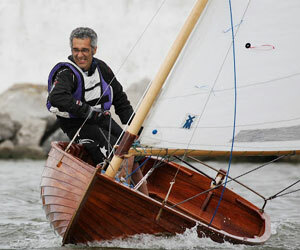 Paolo Viacava, sailing his GRP/wood boat, finished second, and so loses the Bombola d'Oro after 13 previous victories. The first 12' Classic Dinghy, sailed by Italo Bertacca, finished in 7th position overall. On Wednesday 22nd we have had the ceremony, at the Santa Margherita Castle of 1500, where we had our portable exibition The 100 Years of the 12' Dinghy and the first emission of the now-famous Dinghy postage stamp. 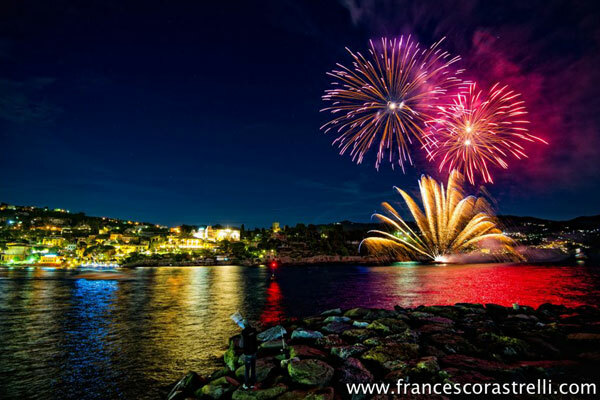 On Fiday night, along the harbour, we enjoyed the usual gala dinner with fireworks. 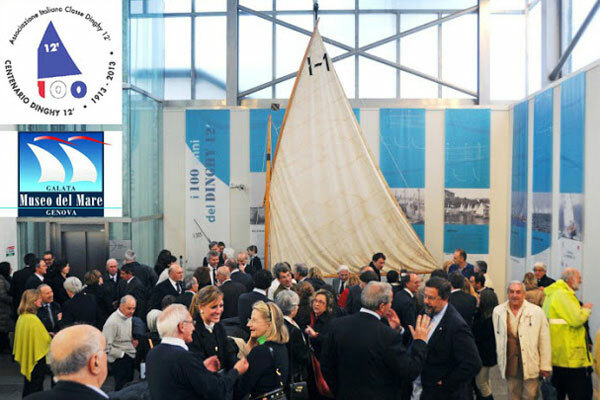 Almost 200 Dinghy lovers attended the official opening of an exhibition to mark the centenary of the Dinghy Class at the Galata Museo del Mare, Genoa on March 9. 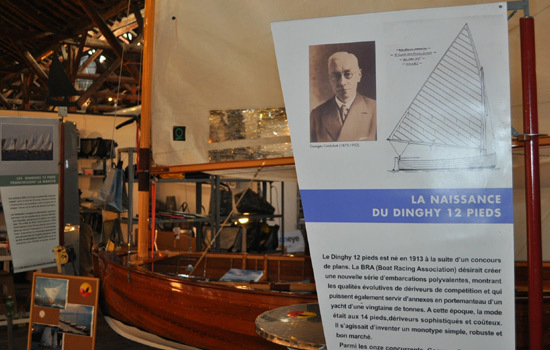 The exhibition, which features the very first Italian Dinghy, Pierino, will remain open until mid-October. 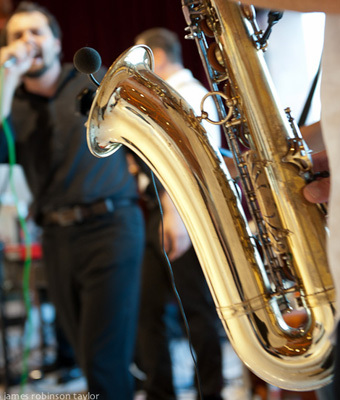 The event received extensive press coverage, including a feature on the RAI 3 national television channel and an article in La Stampa. A number of notable helmsman who had started their sailing careers in Dinghies and several sailing club presidents were keen to pay their respects to Pierino which was built for Piero Reggio in 1929. 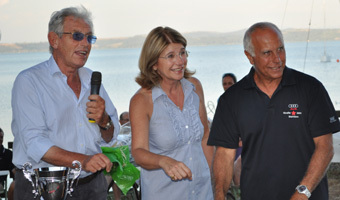 Members of the Italian Dinghy Association and their guests then moved on to the Yacht Club Italiano for their annual prize giving and gala dinner during which Dinghy historian Paolo Rastrelli presented his latest book which details the history and evolution of the class in Italy. to be held in Istanbul during February 2013. October 12th, and once again Rifat Edin and his team at Harun's Paradise, Tuzla, Turkey, prepared to host the final event of the Cockshott Trophy Series. 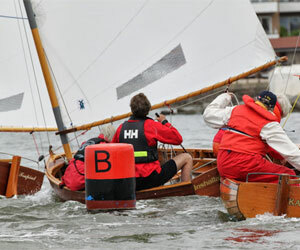 Each year the number of competitors at this regatta increases - this year nineteen boats sailed by helmsmen from six countries participated in what is becoming a very competitive event. The fleet included two newly completed, locally built, wooden boats: one of these, constructed by Roland Bouwkamp and sailed by Reinhard Schroeder was to be the overall winner, whilst the other was a very traditional Dinghy constructed by Michael Summers which is destined to become an exhibit in the Ko� Museum in Istanbul. The weekend provided a reminder of summer for those of us who had travelled from Germany and Holland - cloudless skies and warm sunshine. Despite the light and variable wind a total of five races were sailed. Reinhard Schroeder of Germany sailed consistently well to finish in first place, with Turkish sailor Emrah Tasli finishing second. Third was Giorgio Pizzarello. 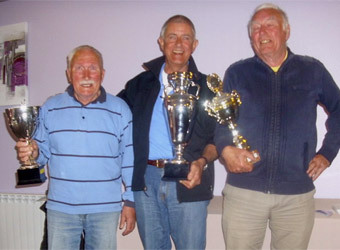 Reinhard's victory makes him the overall winner of the 5th Cockshott Trophy Series in his first year sailing a 12' Dinghy. His committment and enthusiasm - he is the only person to have competed in all the events comprising a Cockshott Trophy Series - makes him a worthy winner. 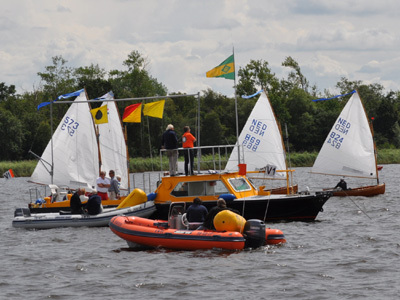 The races were organized by sailing club the Braassemmermeer on 24, 25 and 26 august 2011. 47 teams have inscribed: 46 Dutch and 1 German: Reinhard Schroeder. The Dutch championship is open, which means that a foreigner can become Dutch champion. Reinhard did it the Italian way, he sailed all races on his own and won the single-handed cup. A lot of helmsmen had heard the weather forecast: heavy winds even up to 35 knots in showers and most of them decided to sail the dinghy with two persons. The dinghies got finally 26 knots in their 9,5m2 sail and because Dutch dinghies are classic and heavy they can handle it. Well, almost all of them! It happens of course that some dinghies capsized. The first day there was no stable wind at all. Seven times the committee tried to make a valid start, but after a short time the races were always abandoned, because of a lack of wind. The second day four races were sailed and every time Martijn van der Pol was number one. An excellent result and the base for his final victory. On the next day Pieter Bleeker / Geja van Ommen were in a good shape and won the last two races, also in heavy wind conditions. It was not enough to give them the second place overall: Jeroen de Groot / Damy Jansen are sailing always consistant and ended at number two, just ahead of Pieter. 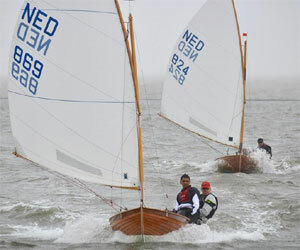 The dinghy of Jeroen has number NED368 and was build in 1935. A real classic! Pieter's brother Wim Bleeker was sailing with his son Marcel Bleeker and ended at number four. Erik van der Meer and his wife Jacqueline Bijder were number five. After four races the fleet was split into a gold and a silver group. 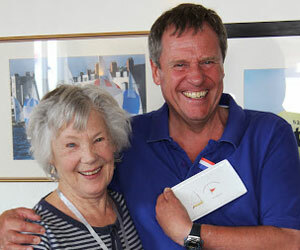 The silver group was won by Jan Bart and Blanche Lucas. A former world champion in the Solo class. 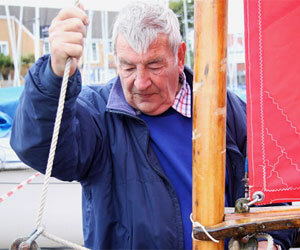 On the first day they capsized, their mast hitting the head of another dinghy sailor Bert Bos. Fortunately no damage to persons or boats. 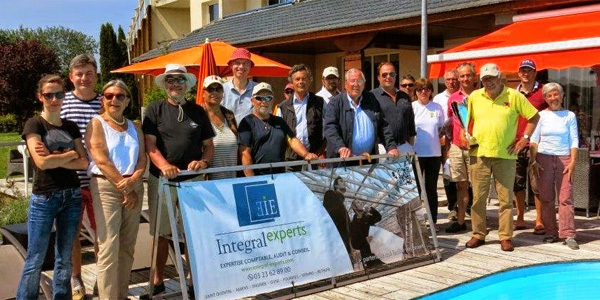 The 13th edition of the Classique de Sciez regatta - and for the first time the 12' Dinghy joined the 6M Jauge International Class in having its own series of races at the event. 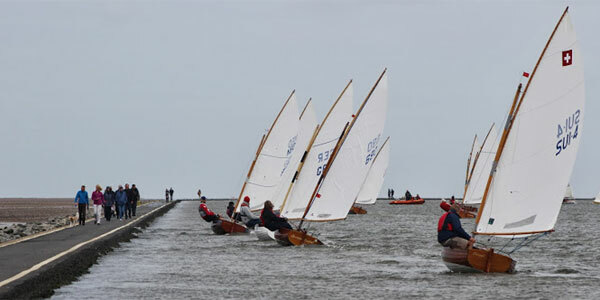 Visiting boats from the Netherlands competed against boats from Switzerland and France as the eleven Dinghies completed five races. 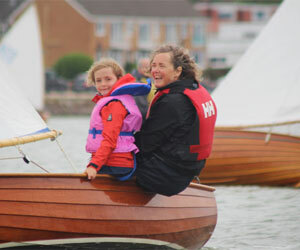 As the following pictures show, the 12' Dinghy has long been the ideal boat for the young-at-heart of all ages. 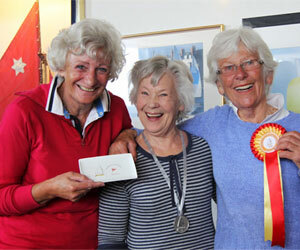 A celebration for three octogenarian (and very active) Dinghy sailors at Loosdrecht, NL. from left to right: Bob van der Pol, 'Master of Ceremonies' Wim Broer, Max Les and Tony Surendonk. Another picture of Tony, this time sailing with Demi Jansen at the World Cup Regatta in Portorož. 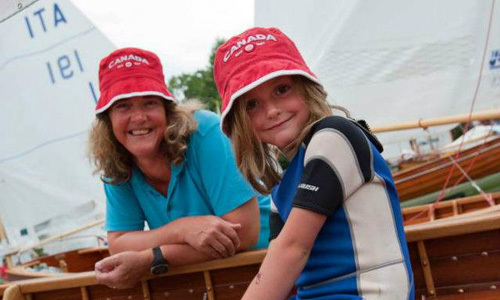 Five-year-old Serena sailing with mother Nicky at the Swiss Championships in Lucerne. The sixteenth edition of the race was held in Portofino from 18 to 20 May. 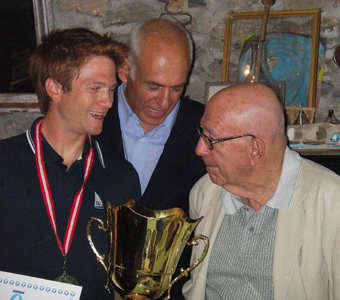 For the thirteenth consecutive time, Paolo Viacava in Mailin has won the 2012 SIAD Bombola d'Ora Challenge Trophy, the YCI cup and the gold medal in the dinghy regatta organised by the Yacht Club Italiano in partnership with SIAD. 78 helmsmen from France, Switzerland, Germany, Canada, Norway, Turkey, Great Britain and Italy took part. 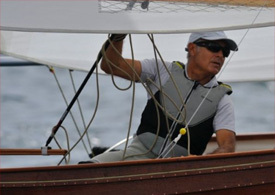 Attilio Carmagnani in Karmasutra won the Bombola d'Argento Challenge Trophy, which was awarded to the first of the classic boats (wooden hull and rig). 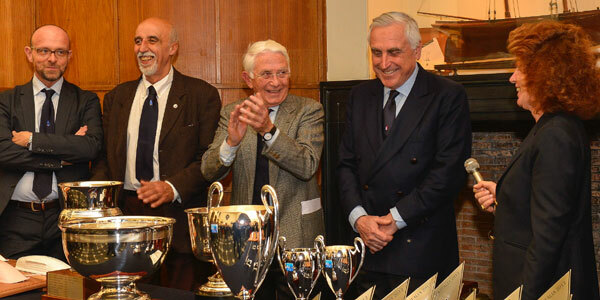 The 'Giovanni Falck' Perpetual Challenge Trophy for the best team consisting of 3 helmsmen belonging to the same club went to Attilio, Emilio and Alberto Carmagnani. Nicky Arnoldus (Canada) in Behemot won the prize for the first helmswoman. 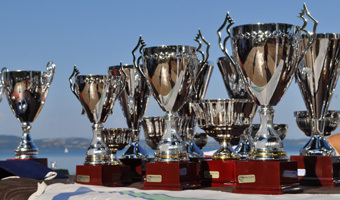 The 2012 SIAD Bombola d'Ora Trophy is the first regatta in the National Circuit of the Dinghy Class and open to all types of 12' dinghies, from traditional wood to fibre-glass boats. 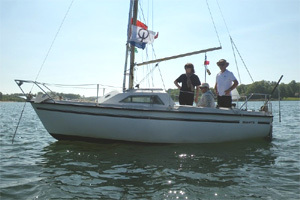 It forms part of the International Series for the George Cockshott Trophy, which was donated by the grandson of the English designer of this boat. 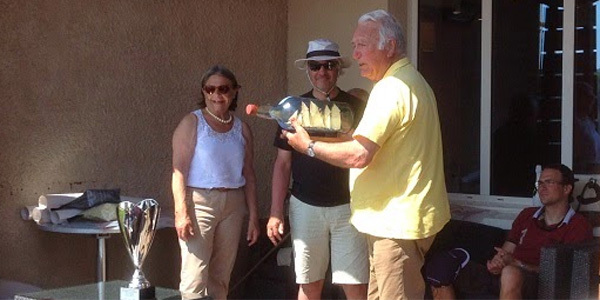 Francesca Lodigiani (Secretary of the Italian Association) introduces Pierre Lambert to the finer points of an Italian Dinghy. 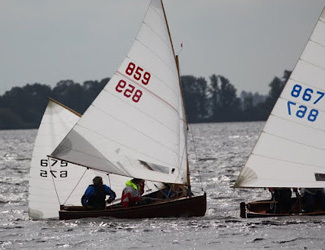 Last weekend Lübecker Yacht-Club and the 12' Dinghy Flotte Nord had their traditional start of the sailing season event on the river Wakenitz in Lübeck. 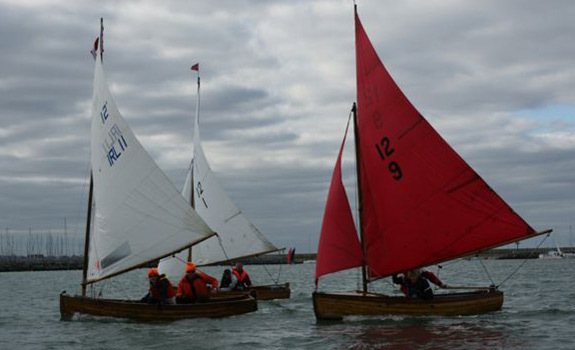 Despite inclement weather 8 Dinghies took part and a total of 5 races were sailed. Overall winner was Peer Stemmler, followed by Andreas Fuhrhop and Indra Stülcken in second place. The third podium position was taken by Bernd Paul Ihde and Matthias Preuss. 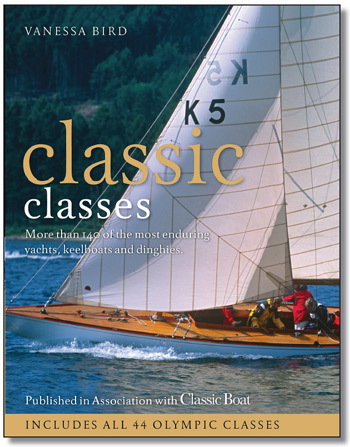 UK yachting journalist Vanessa Bird, a long time a friend of the 12' Dinghy, has just published her book Classic Classes which features 144 designs from around the world, including all the Olympic classes. This is the complete reference to the classic yachts and dinghies still sailing today. Focusing on the most well-known, popular and enduring designs - from the 7ft Optimist to the 125ft J class. 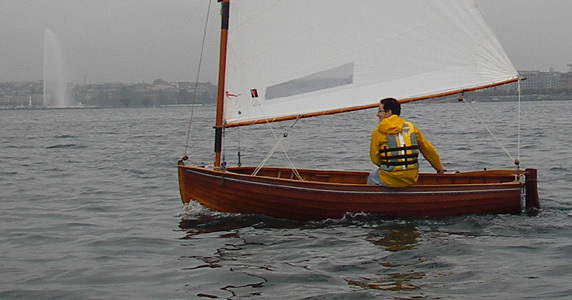 Naturally the International 12 Foot Dinghy is amongst the classes featured. 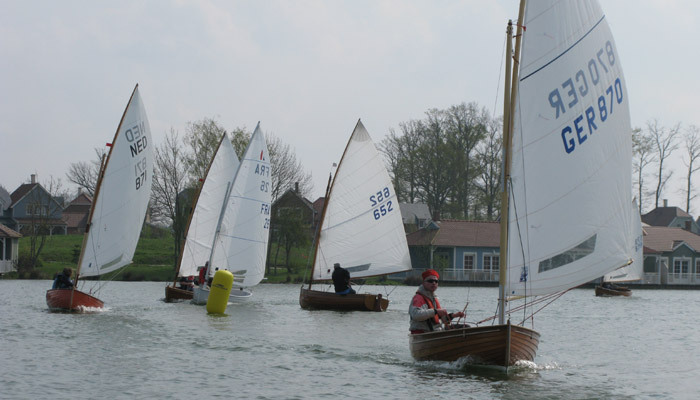 The first event of the 2012 Cockshott Trophy series, sailed on the Lac de l'Ailette, Saint Quentin on the 14-15 April, attracted eighteen competitors representing four countries. After seven races, the podium was occupied by a trio of Dutch sailors, Daan Daniels, Aad Bergwerff and Fred Udo. German Reinhard Schroeder, sailing his brand new boat Isabella, finished in fifth position, and French sailors Pierre Moneger and Loic Blanken took the seventh and eighth places. 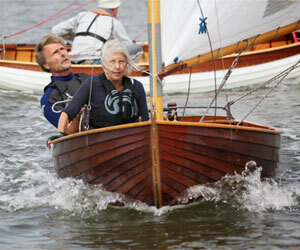 The first lady sailor, Nicky Arnoldus from Canada, finished ninth in another newly constructed Dinghy named Berk. The first Dinghy hull to be constructed by Roland Bouwkamp, Turkish boat-builder Cengis and apprentice Matthijs, has been taken off its mould and fitting-out has begun in preparation for the arrival of an official measurer from the Netherlands. In mid-January the first two boats will be shipped to the Netherlands for exhibition at the Boot Holland show in Friesland. 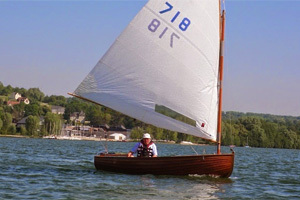 Subsequently one Dinghy is expected to join the Lake Geneva fleet. Contact Roland Bouwkamp (info@12footsailing.com) for more details. In a throw-back to the days when the 12' Dinghy was first conceived as a yacht tender, the 38-metre sailing yacht Mariette constructed in 1915 to a design by Nathanael Herreshoff, carries two Dinghies for the use of guests. Named in honour of Harun Ulmen, Turkish naval architect and Olympic sailor, this unique site on the Marmara Sea has become the regular venue for the final event of the annual Cockshott Trophy series. Excellent sailing conditions greeted the 18 competitors representing Turkey, France, Italy, Germany, the Netherlands, Canada and Great Britain who competed in this truly international affair. 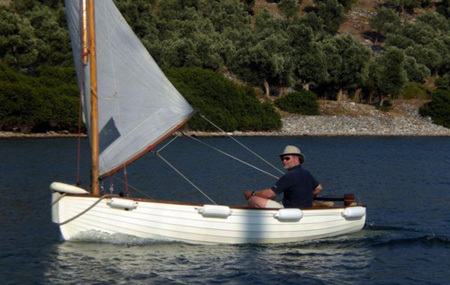 Rifat and his team had prepared a fleet of 15 Dinghies and we were joined by Eytan Levi who has recently acquired three Lithuanian-built Dinghies for use at his Bungalow Park. Young Turkish Laser sailor Kaan Mazlumca dominated the event, winning all four races, whilst Pierre Moneger managed a string of second places but was denied a well-deserved place on the winner's podium due to being adjudged OCS at the start of the second race. Whilst these two sailors dominated the front of the fleet, the racing was nevertheless competitive with some very close finishes. The extraordinary Harun's Paradise estate, the warm welcome from Rifat and his team, and Sanem's hospitality and organizational skills make this an event not to be missed. Will you be there next year? 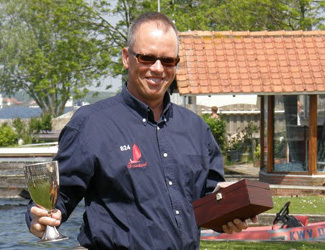 The 2011 Dutch national championship has finished and once again the victors are Jeroen de Groot and Damy Janssen. 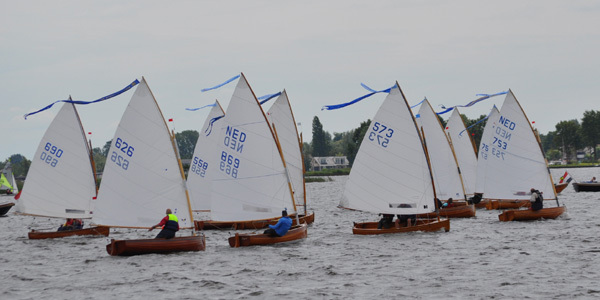 Forty-seven teams competed at the Gongarijpster Poelen, a lake near the bigger Sneekermeer. Each year more and more young talented sailors take part. This year, for example, the Yngling worldchampion, Tom Otte, and the national champion in the Valken klasse, Menno Huisman. 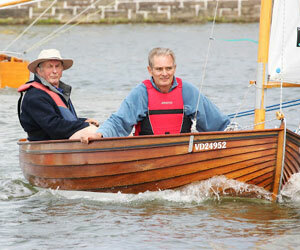 They both agreed: the dinghy is a difficult boat to sail and both where surprised to be passed by old experienced sailors dinghy during the regatta. A total of seven races where sailed under strong wind conditions during the first 2 days, with almost everyone chosing to sail with a crew to keep their boat flat. 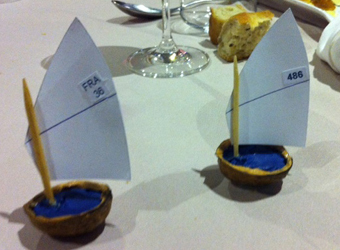 The last race was sailed with a wind strength of Beaufort 2 - a comfortable dinghy wind but with extreme wind-shifts. Wim Bleeker was the runner up. Right up until the last race Wim Bleeker still had a small chance to become champion. If Jeroen ended as number 8 and Wim as number 1, he would take first place. But unfortunally he was too early at the starting line and Jeroen is not someone who makes a lot of mistakes. So, the same result as in 2010 for Jeroen de Groot and Damy Jansens finishing first to loud applause from the spectators. Wim was the runner-up followed by the always strong Emile Westerhof. 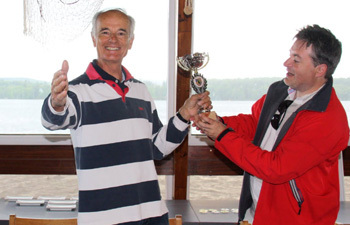 Fourth place was taken by the 66 years old Huib Ozinga. The former national champions Pieter Bleeker (5), Joep Brinkman (6) and Martijn van der Pol (7) followed the top sailors home. 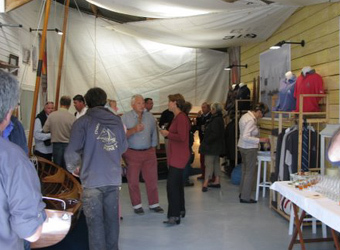 Last Thursday the Dinghy Shop at Douarnenez opened it's doors for the first time. An initiative of the society Comet Organisation, the shop is situated on the banks of the river at Port-Rhu, under the club-house of the Atlantic Yacht Club. 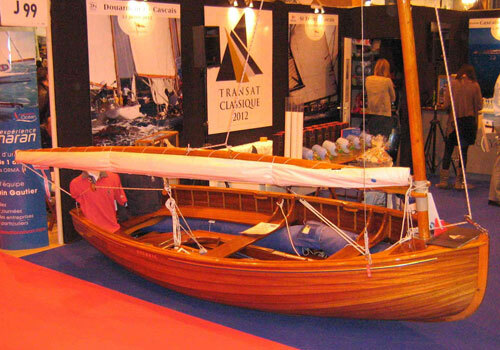 Comet Organisation will be the sole French distributers for boats built by the renowned Dutch shipyard Van de Meer. 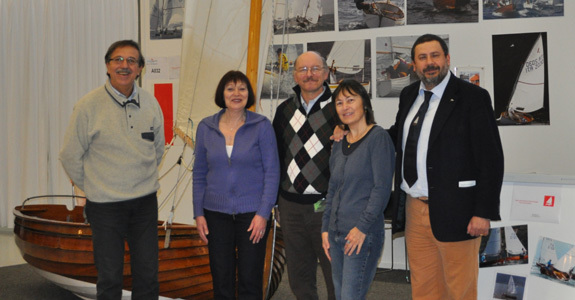 "Avec cette initiative, voil� un nouvel �l�ment de promotion du dinghy et de la jeune Dinghy 12' Classe France". 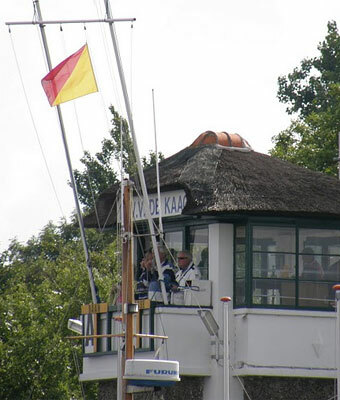 It has become a long-standing tradition that the Dutch "Twaalfvoetsjollenclub" and the "Koninklijke Watersportvereniging de Kaag" organize the Cockshott Trophy event at the Kaag each Whitsun. This year 44 dinghies representing four different nationalities took part: Netherlands, Japan, Italy and Germany. As usual there was a long race through all the small canals of the Kagerplassen, prompting a Japanese competitor to observe that this was the first regatta in which he had been watched by cows! 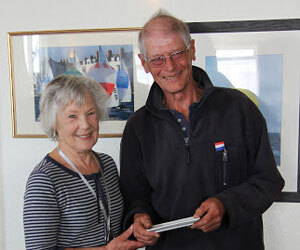 Overall winner was Pieter Bleeker, with local sailor Hans Nieuwland second. 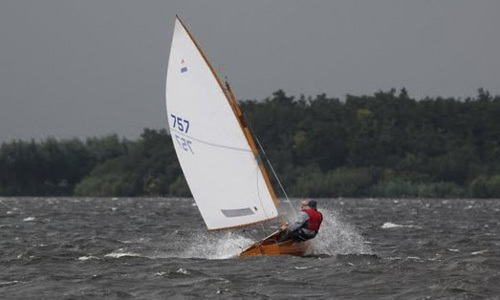 Duuk Dudok van Heel (4 times world champion in the Flying Junior class) finished in 3rd position despite his dinghy being equipped with a 15-year-old sail. Tom Fick was 4th and Fred Udo 5th. 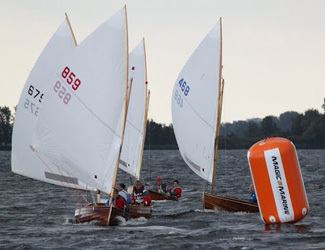 Three times Dutch champion Joep Brinkman, who is now living in Berlin and has not much time for sailing anymore, finished strongly and will surely be amongst the challengers at the next Dutch championship (29-31 July). A special mention for everybody's favourite, Tonny Surendonk, who finished in 8th position, close behind Hans Reyers. 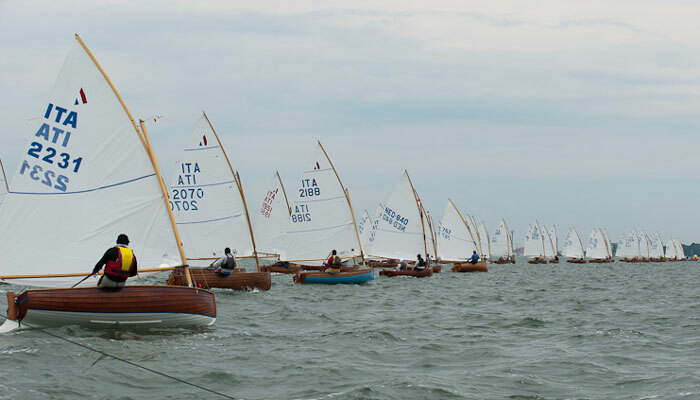 June 1st, 2011, and the largest ever fleet of International 12-foot Dinghies, comprising sixty-six classic (wooden) boats and thirty-eight modern boats, manned by sailors from ten countries, assembled on the Lagoon of Venice for the second Dinghy World Cup of the modern era. 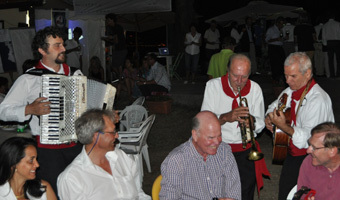 The event was organised by the Compagnia della Vela di Venezia as part of their centenery celebrations, supported by the Circolo della Vela Mestre, Associazione Velica Lido and the Circolo Nautico Chioggia. 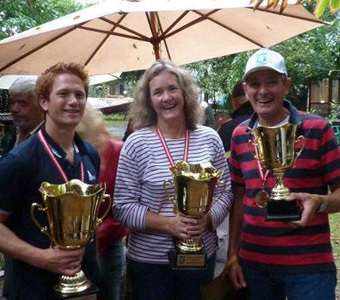 The Dinghy World Cup has now become an established event on the Dinghy racing calendar. It is likely that the 2012 event will be sailed at Portorose, Slovenia. A cold wind gusting to over 25 knots welcomed the fifteen competitors to the Coupe de France Dinghy 12. In these 'sporty' conditions the fleet suffered some broken spars and capsizes, justifying the presence of two powerful safety boats from l'Association Petite Plaisance de Cornouaille. The most unexpected event was the capsize by the Dutch sailor, Fred Udo, proving that such mishaps can happen to the best of helmsmen. At the end of the first day only two points separated the first four boats sailed by Loïc Blanken, Gwendal Jaffry, Camille Long and Jean Pol Kerbaol. 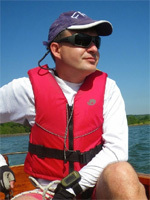 Thanks to his capsize, Fred Udo, brilliant winner last year, was languishing in 7th position. By Sunday the wind had dropped, but the contest intensified. Jean Pol Kerbaol was in the running for a podium finish until breaking his tiller, leaving Gwendal Jaffry and Loïc Blanken to fight for the first two places. A late charge by Fred Udo who won the last two races resulted in him claiming the third podium position. 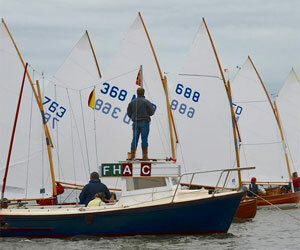 Nine boats, representing four countries, assembled on the starting line for the first-ever regatta for International 12-foot Dinghies to be sailed in eastern France, on the weekend of 14-15 May 2011. This event, organised by the Swiss Dinghy Association and the Club de Voile des Settons, was sailed on the beautiful Lac des Settons in the Morvan region of Burgundy. Despite inclement weather a total of seven closely contested races were completed. 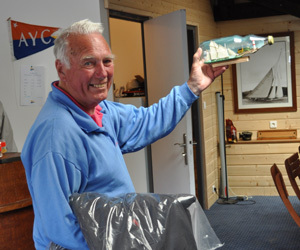 Overall winner was Swiss sailor Michel Nerbollier sailing his new boat Dinghy Toy. 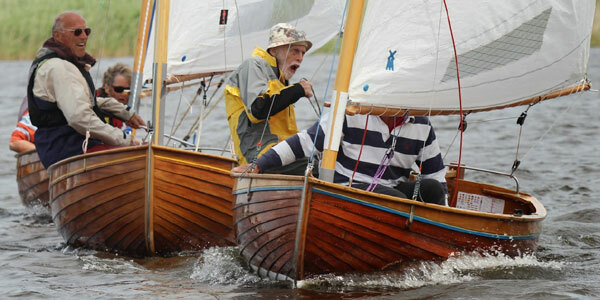 Fred Udo of the Netherlands finishing second in Waterlander and Steve Crook and his 1943-built Einepyk took the third podium position. The first French boat was sailed by Nicolas Saumagne who finished fourth. 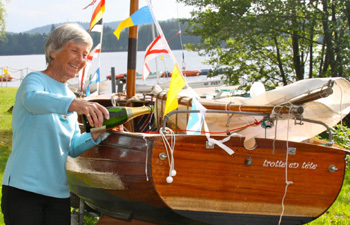 Marie-Claire Guégan's Dinghy Trotte en Tête. 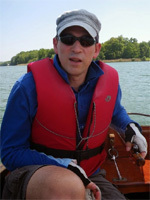 The Lac des Settons is an ideal venue for our boats and there are hopes that a Dinghy fleet will be established there. 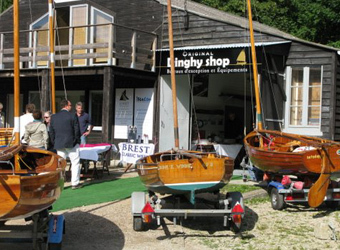 Sailing club president Jack Salingardes will be delighted to welcome actual and potential 12' Dinghy owners. Contact Jack on (+33) (0) 6 59 30 27 10. Thanks are due to both Jack and co-organiser Romain Berard for their help in making the event so successful. 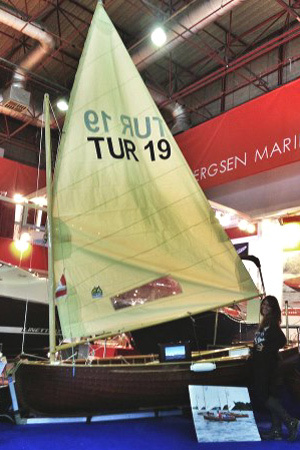 For the first time, the 12' Dinghy Class exhibited at the Swiss Boat Show in Berne. Our stand generated a great deal of interest - with many people commenting upon how nice it was to see a 'real' boat amongst the plastic bathtubs on display! 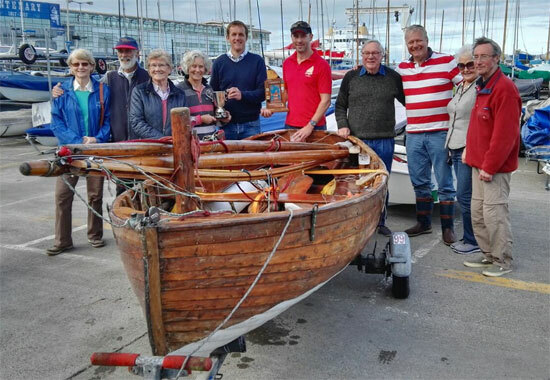 Not only did the show introduce the Dinghy to many people who had not previously seen one, - it also enabled us to meet a number of owners who were previouly unknown to us. Entirely thanks to our SuisseNautic stand the known Swiss fleet has grown by three boats! 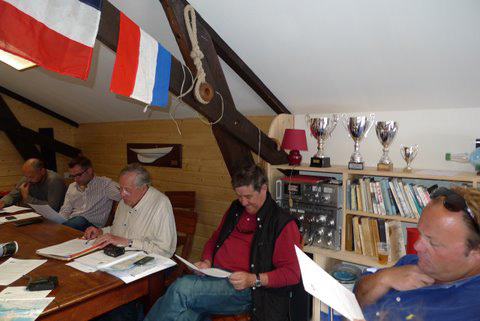 SuisseNautic also provided the setting for the inaugural meeting of the Swiss International 12 Foot Dinghy Class Association. NED486 Einepyk, built in the Netherlands in 1943, and a newly-built boat from Ernesto Riva, on display at SuisseNautic. 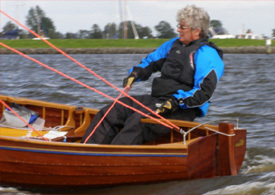 Proud owner Wim Bleeker shows off his newly constructed Dinghy, NED870, at the Boot Holland exhibition at Leewarden. 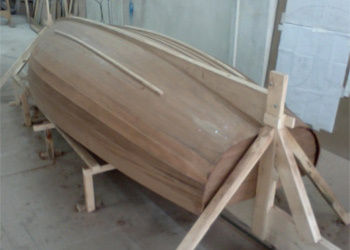 Builder Jeroen de Groot is now planning to complete a second Dinghy in time for the 2011 World Cup event in Venice. A new chapter begins for the Twaalfvoetsjollenclub as Pieter Bleeker, chairman for the past five years, retires and is replaced at the helm by Henk van der Zande. 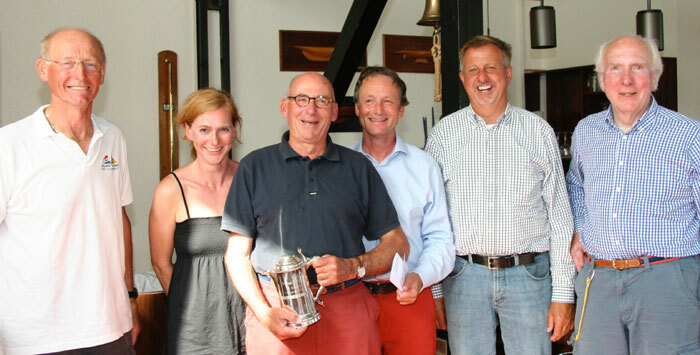 Pieter Jan Sandbergen also retired after six years of sterling service. 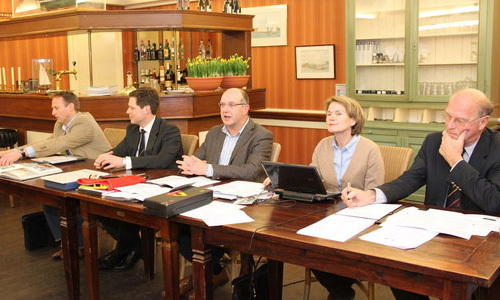 Newly elected committee members Karel de Boer and Rieks Reijers complete the 2011 team. 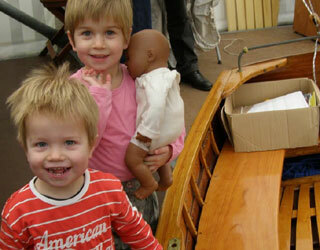 As always, the Dutch Dinghy Association was present at the annual Klassieke Schepenbeurs at Enkhuizen. 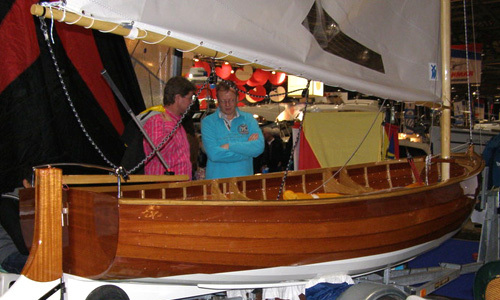 This year the association chose to exhibit one of the Netherlands' longest surviving dinghies. Dinghy 49 was constructed by the Belgian boatbuilder, Fr. Anemans, in 1923. 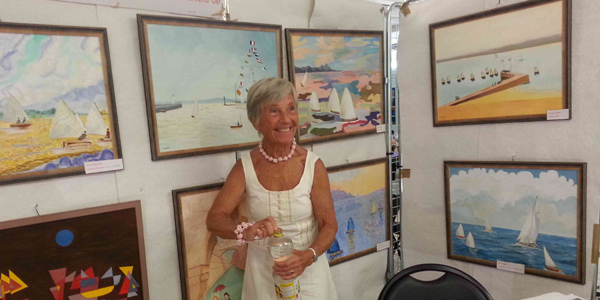 Former owner, Mrs Borrie, was astonished to see the boat that she sailed from 1958 to 1965, on display at the show! The first International 12 dinghies to appear on the L�man were built at Corsier Port in 1920 by the Chantiers de Constructions Navales du L�man for members of the Soci�t� Nautique de Gen�ve. By the mid 1930s some thirty 12' dinghies were saiing in the Petit Lac. Thereafter the fleet quickly dispersed. 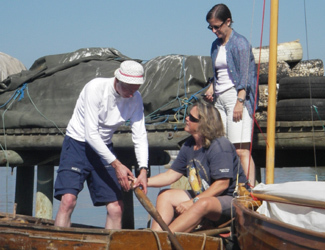 Then, in 2010, Jean-Claude and Louisa Marchand introduced their 1923 Abeking & Rasmussen built dinghy to the club. 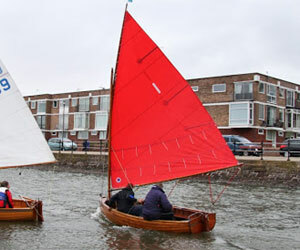 This weekend they were joined by other dinghies for what will, we hope, be the first of many Sailing in the City events. We finally got all the Irish 12s together - 100% turnout of the operable boats in the country! 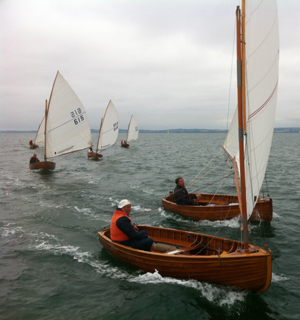 Three of these were standard International 12-foot Dinghies and three were rigged as Dublin Bay 12s. We had 2 races on a windward-leeward course from the Royal St. George YC at Dun Laoghaire. Gail Varian won both in her newly restored DB12. I had a 2nd and a 3rd as did the Sarrat Brothers. Brian O'Connell's boat suffered the mishap of a broken rudder in the 2nd race (which was also only the 2nd race in which Brian has competed). The racing was surprisingly close with the single sail boats not falling too far behind upwind and possibly faster than the DB12s downwind. 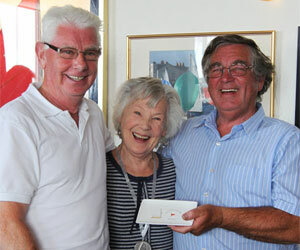 Veteran Dinghy sailor Keith Collie, and Gordon Piper performed OOD, rescue and photography services. 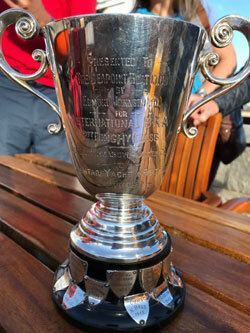 There seem to be several old trophies still around that we could race for in future, including a cup from 1921 that we hope to borrow for a proper race series to be hosted by Sutton Dinghy Club next year. 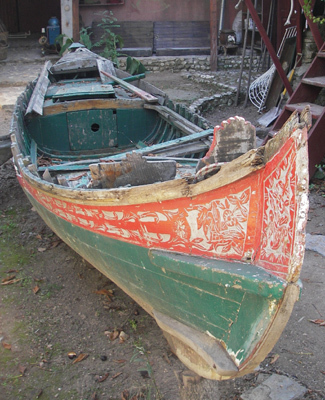 Two more old Dinghies have been 'discovered' recently and will hopefully join the fleet after restoration. 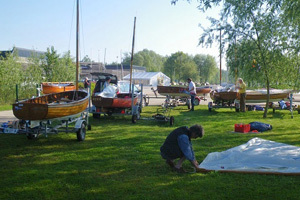 This weekend we have held the Dutch championship 2010 on the Loosdrechtse plassen. 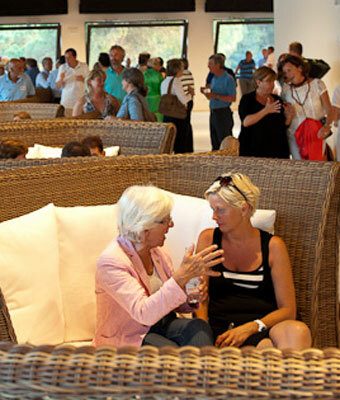 The sailing club "de Vrijbuiter" has organised the event perfectly. 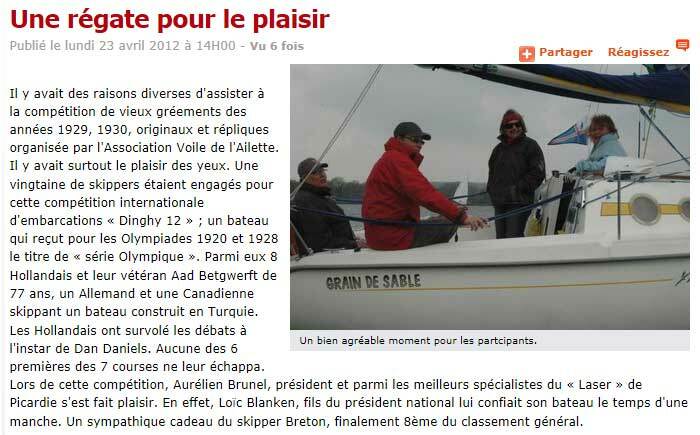 50 dinghies participated. 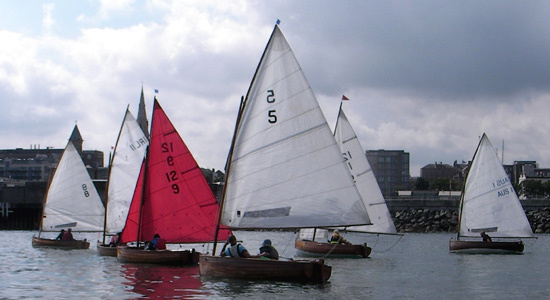 The first three regattas were divided in two groups of 25 dinghies. After these heats the gold fleet of the 25 best sailors in Holland competed in the champions group and have sailed another 2 regattas. There was nothing to choose between the crews at the front of the fleet and the final result was in doubt until the very last moment, with six crews having the potential of winning the event. Jeroen de Groot and Damy Jansen made the fewest mistakes and are the new Dutch champions finishing with positions 1st, 1st, 2nd ,8th and 4th. Emiel Westerhof and his son Erik Jan finished in second place with 4th, 1st, 1st, 13th and 3rd. Geja and I finished third with 1st, 2nd, 5th, 2nd and 13th. So, for the fifth time is Jeroen Dutch champion. 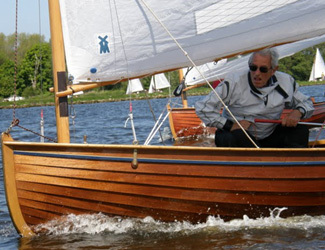 Three times in the Pampus class and once in 2009 in the 16m2 class. And now, in 2010, also in the 12foot dinghy class. A special mention for our grand lady Tonny Surendonk, who finished in eighth position. 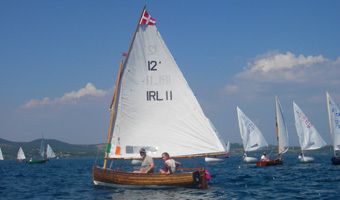 Just eighty-five years after the last Dinghy World Cup was sailed in Cork Harbour in 1925, ninety-three International 12-foot Dinghies representing eight countries took to the waters of Bracciano for the 2010 Dinghy World Cup. 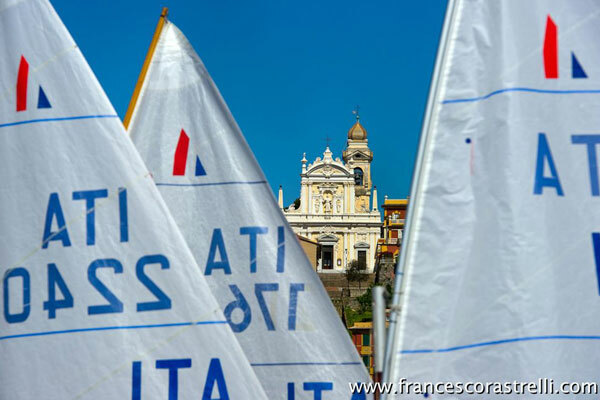 This superb event, which was brilliantly organised by the Associazione Italiana Classe Dinghy 12p, the Sailing Team Bracciano and the Tiberino Sailing Club, was won by Vincenzo Penagini of Italy (classic fleet) and Pieter Bleeker of The Netherland (sailing a modern GRP dinghy). Following the success of this event, further World Cup regattas are now being planned for the forthcoming years. I bought a polyester 12-foot dinghy and towed her behind my boat Sylphe. We covered 500 nautical miles between Istanbul and Bodrum in a month. Sylphe is a Bermudan cutter rigged yacht, with an overall length of 60 feet. She was built and designed in France, by Andr� Mauric (who was later involved in the design of the Eric Tabarlay's famous Pen Duick). Her construction was started in October 1940 and she was launched in 1947. ... and the tender, now baptised 'Love Me Tender', followed Sylphe wherever she went and was sailed in many of the bays and ports en-route. 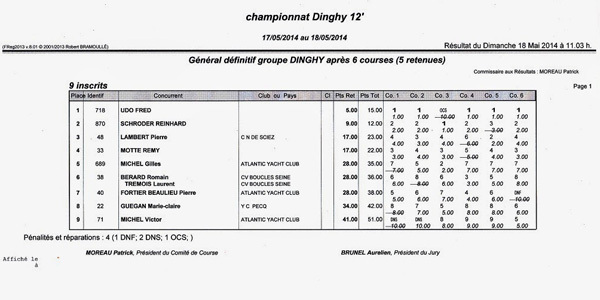 Fred Udo convincingly won the Challenge des Dinghies de 12 Pieds with local sailors Loïc Blanken and Gwendal Jaffry taking the second and third place on the podium. 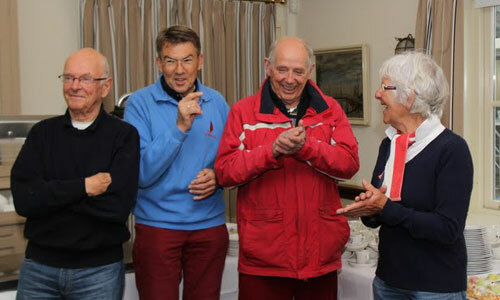 The event, which was superbly hosted by the Atlantic Yacht Club in Douarnenez, attracted considerable interest from the French press, both locally and in the specialised yachting press. 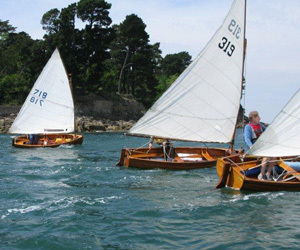 This was almost certainly the first regatta for 12' Dinghies to have been sailed in France since 1925 when four boats competed in a race in Nantes. 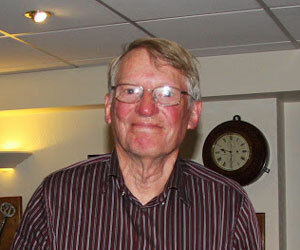 Organiser Jacques Blanken is now looking forward to welcoming a larger fleet to next years event. 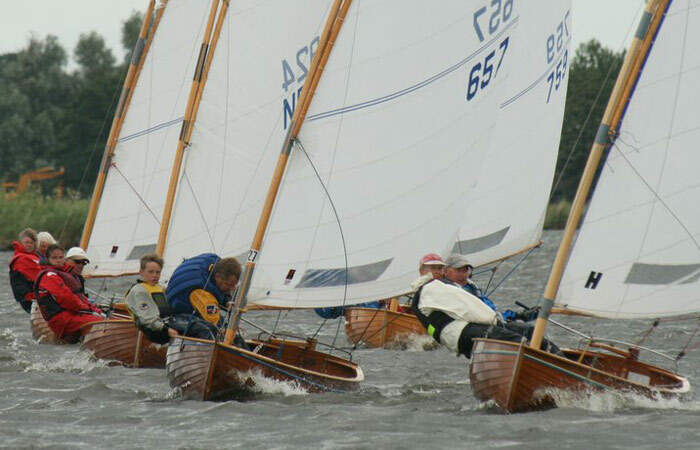 On 22-24 May one of the most famous regattas in the 12-foot dinghy calendar was held on the Kaag lakes. 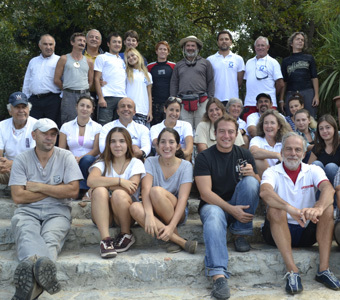 50 dinghies participated this year, with representatives from Japan, Germany, England, Lithuania, France and Italy. And of course a lot of Dutch dinghy sailors! Two new dinghies had their maiden voyage. 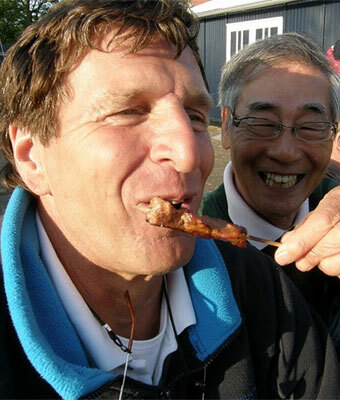 The organizers has arranged a barbecue and of course the traditional dinner at the Kaagsocieteit. The weather was perfect with windforce 3-4, only the long distance race, through all the small canals, was cancelled this year due to a lack of wind. 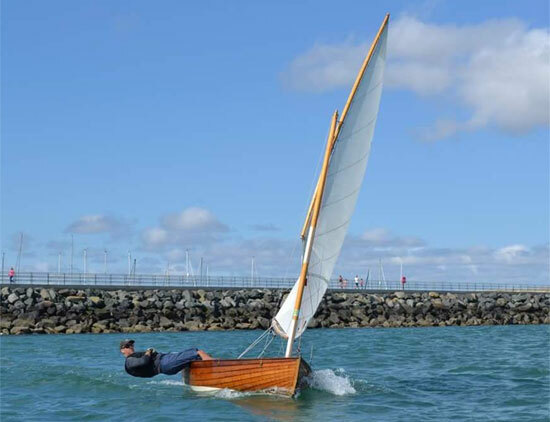 After an absence of 60 years, 12-foot Dinghies are returning to the Soci�te Nautique de Gen�ve. 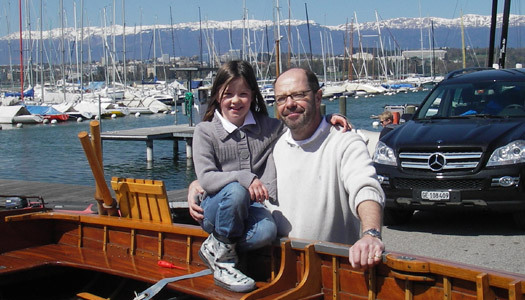 Here Louisa Marchand helps her father, Jean-Claude, prepare the latest addition to the Lake Geneva Dinghy fleet. Louisa's next task is to choose a new name for her new boat! Over 140.000 people have visited the IV BIG BLU, Boat Show and the Sea of Rome from 20 to February 28, an exhibition of 90.000 square meters, with around 800 boats on display. On the stand Italian Federation Sail-Allianz were present, with full sails hoisted, the associations of class of the competitive sail from the mono-types of the sport-boat to the Olympic classes up to the classes of youth initiatives. 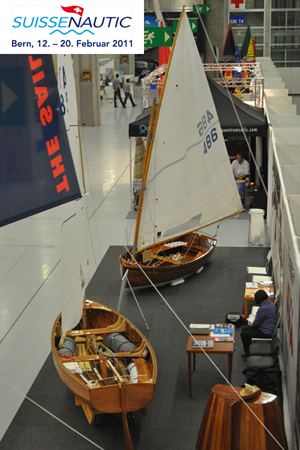 The only other place where such a concentration of sailing dinghies can be admired is at Alexandra Palace, in London at the RYA DINGHY SHOW. 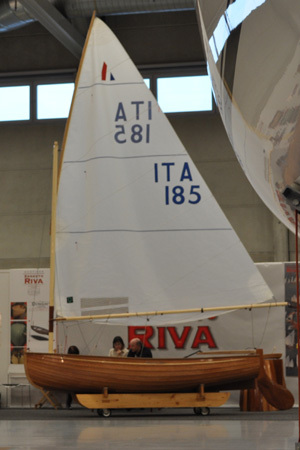 L'Italian Association Class Dinghy 12' has set up a stand of thirty square meters with a lot of screen on which flowed the Images of the Dinghy 12 feet designed by G. Cockhott. On show the three versions of the Dinghy 12 feet, a Lillia built around GRP, a Patrone of the series of the Committee of the GRP-wood and a beautiful Colombo all wood, which was surely the most photographed boat in the pavilion. The West Japan A-class Dinghy Regatta to be held on 29th and 30th May in New-Nishinomiya Yacht Harbour is expected to attract some 20 boats sailed by the alumnus of various Japanese Universites. The following month approximately 60 dinghies are expected to take part in the 20th All Japan A-class Dinghy Championship Regatta which will take place in Fukuoka Hakata Yacht Harbour on 26th and 27th June 2010. Fukuoka Hakata Bay is one of the largest bays in the Kyushyu region and has long been the venue for major sailing events. These events are organised by the Japan A-Class Dinghy Association (JADA). 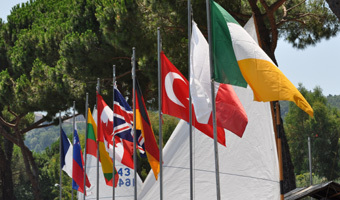 Hopefully, some Japanese crews will be present at the Dinghy World Championships to be held in Italy in July 2010. 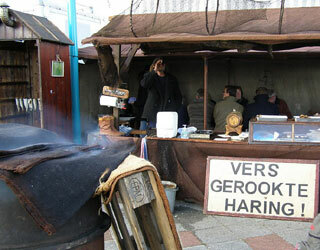 The 13th Beurs Klassieke Schepen was held in Enkhuizen on 6, 7 and 8 November 2009. 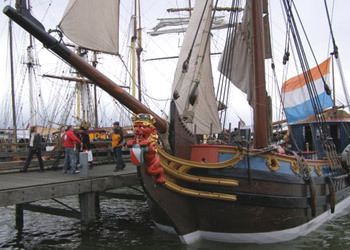 It is advertised as the only fair in Europe that combines shipbuilding, maintenance, restoration and conservation of classic and traditional boats. This three-day show is considered by many to be the meeting place for commercial and pleasure yachting; for skilled ship owners and dedicated enthusiasts of traditional vessels and shipbuilding crafts. 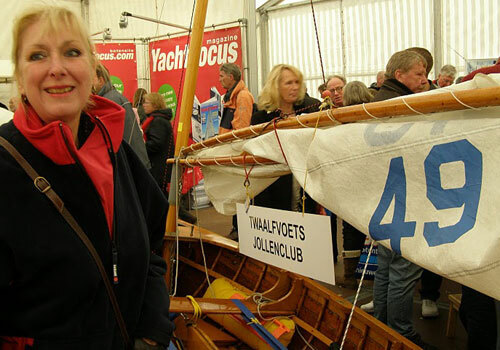 Naturally, the Twaalfvoetsjollenclub was there, and as usual their 12-foot Dinghies attracted a lot of interest. Photos by Geja van Ommen. and regattas having international participation.